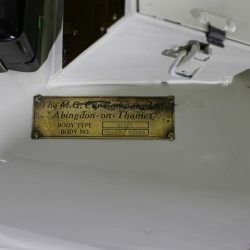 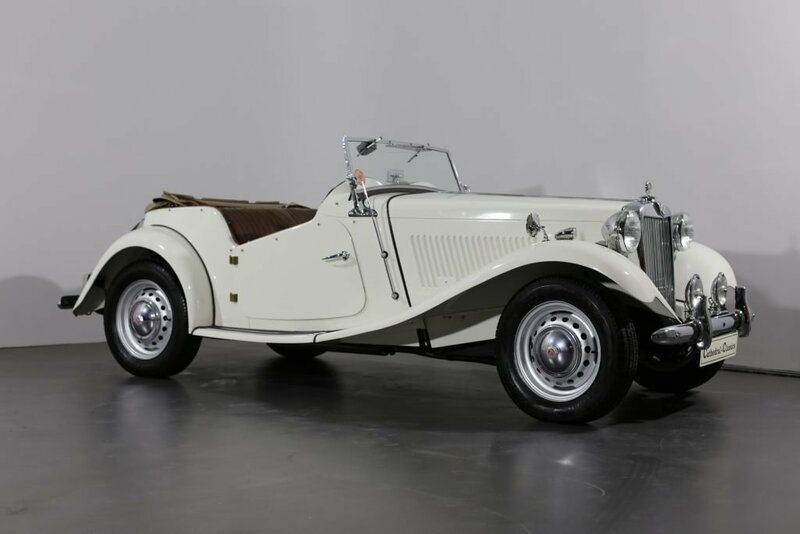 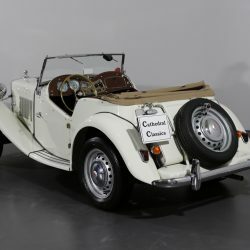 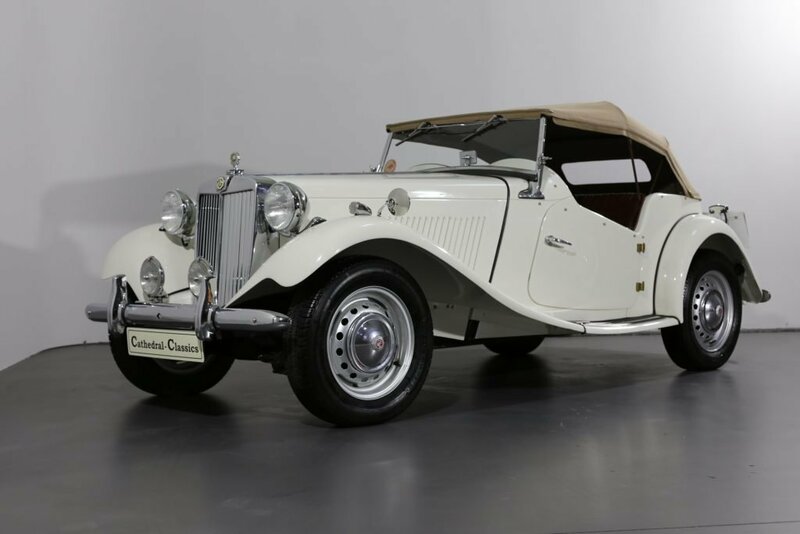 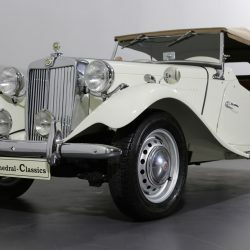 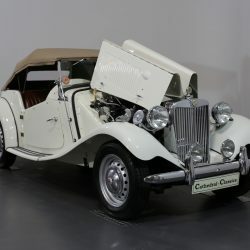 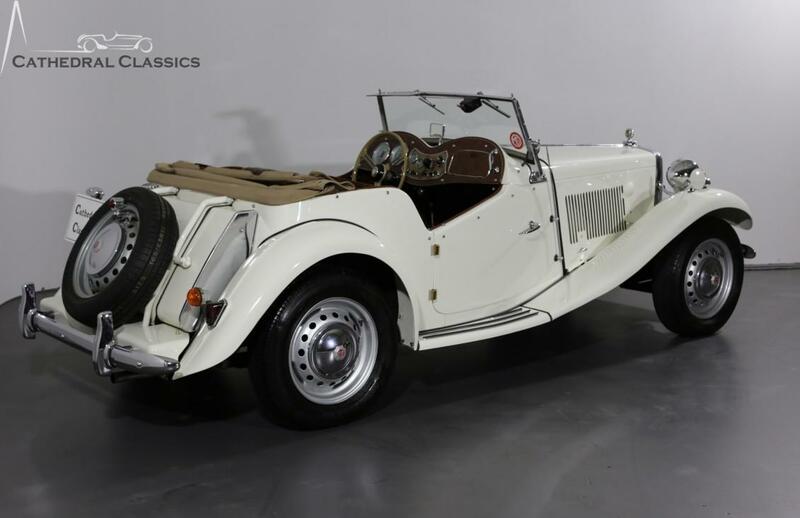 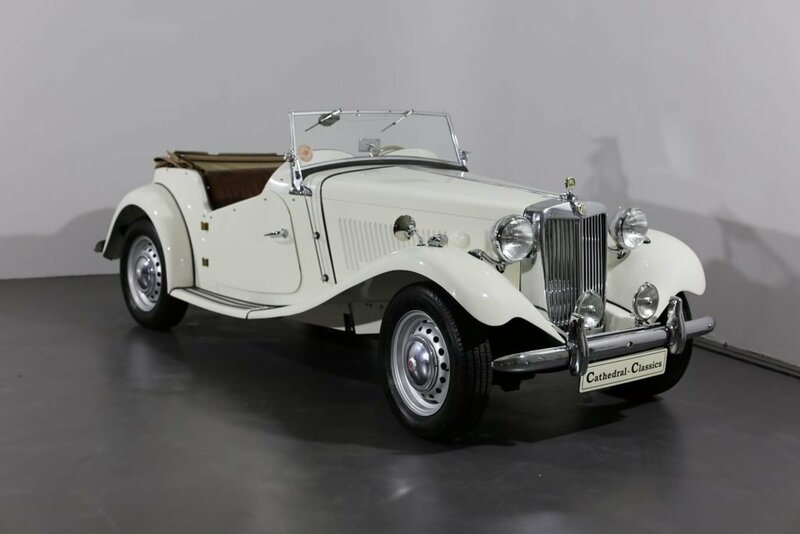 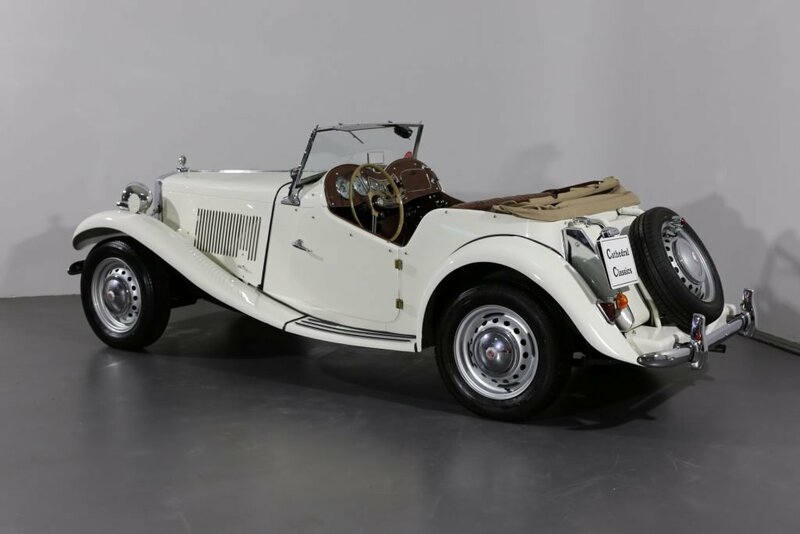 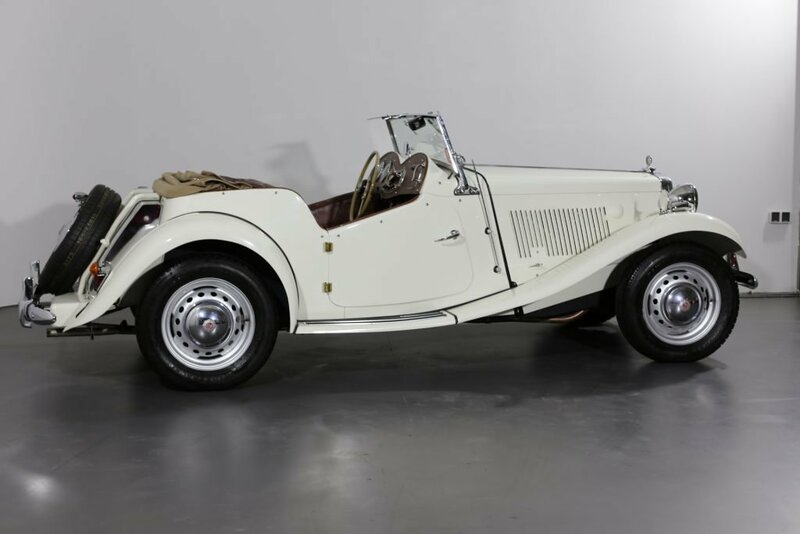 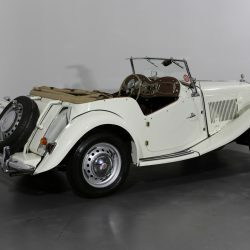 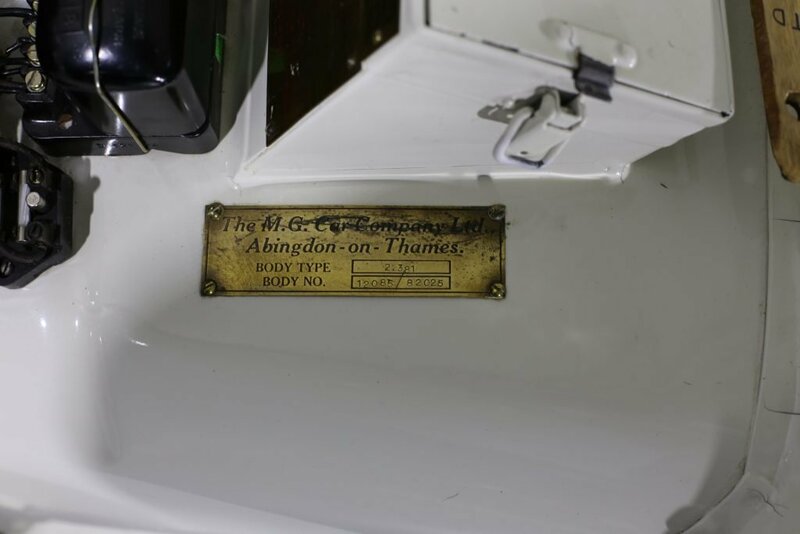 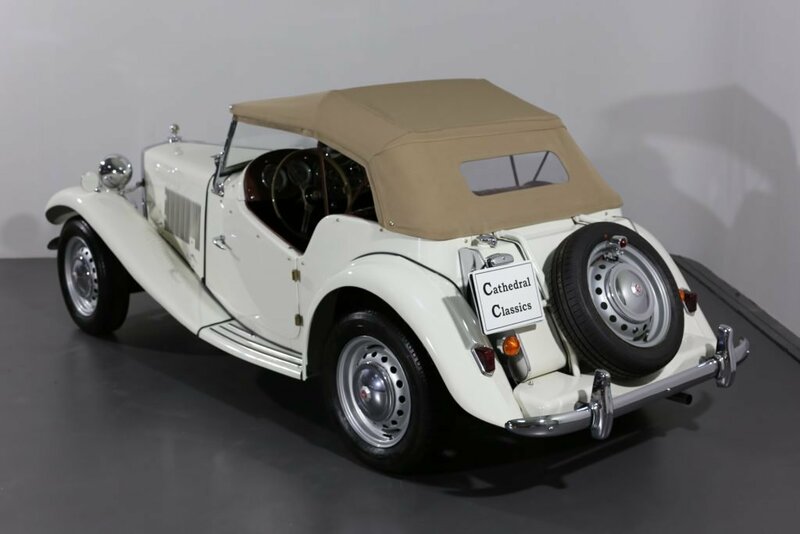 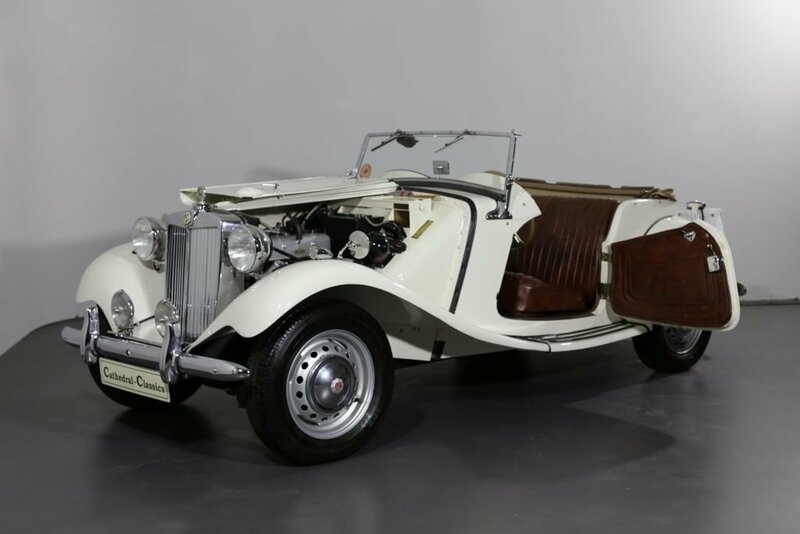 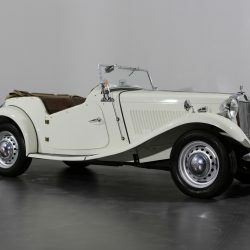 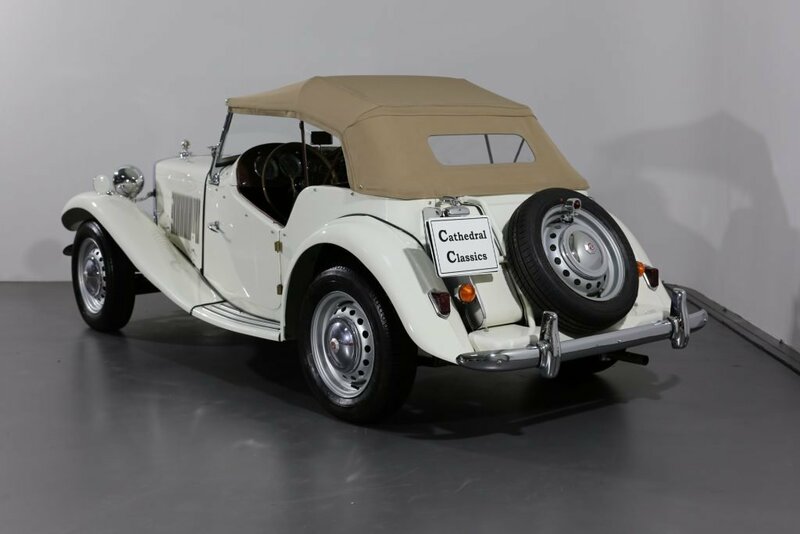 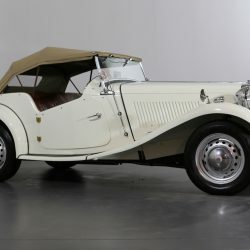 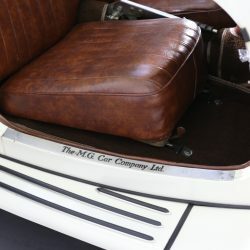 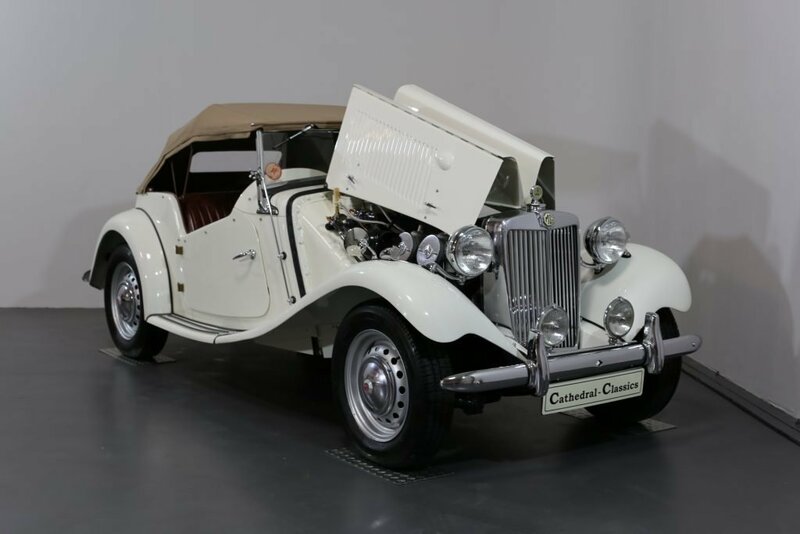 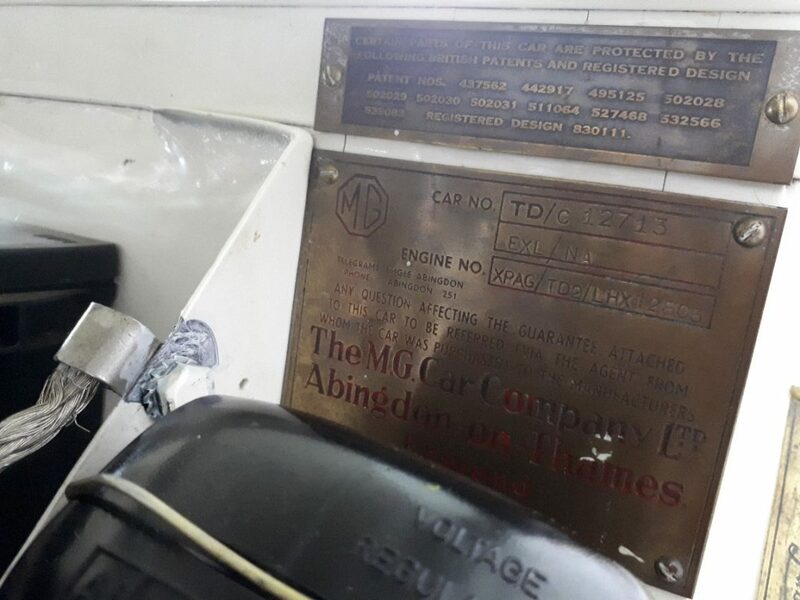 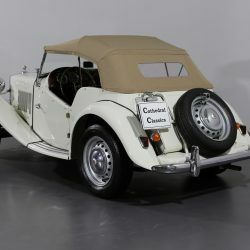 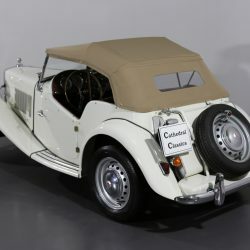 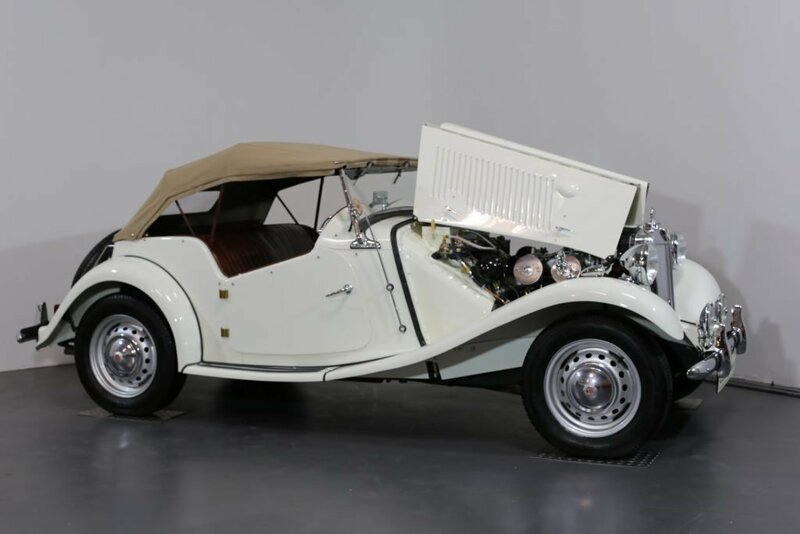 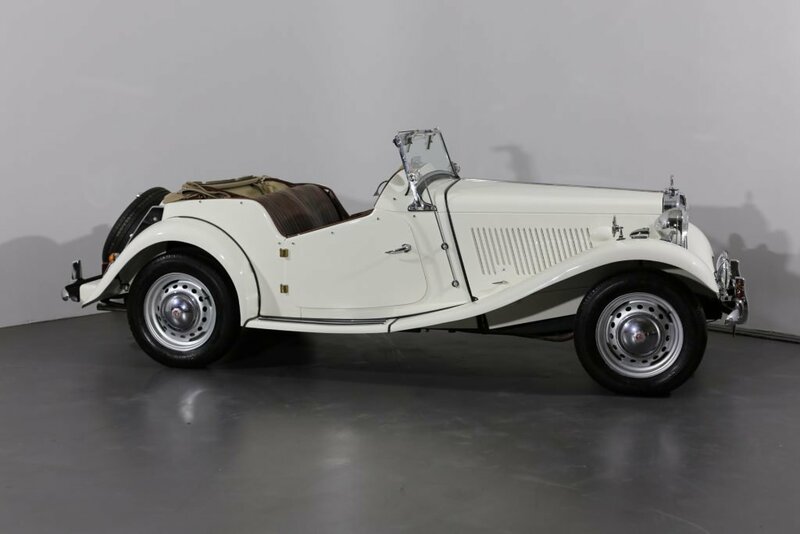 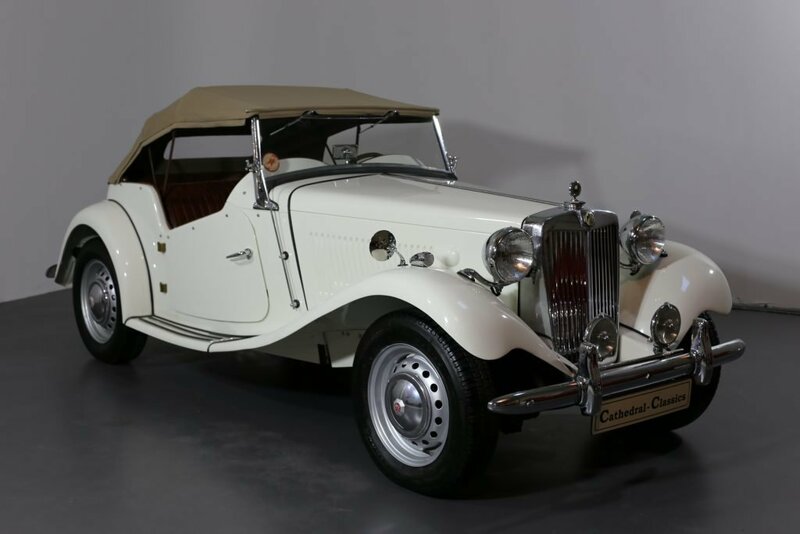 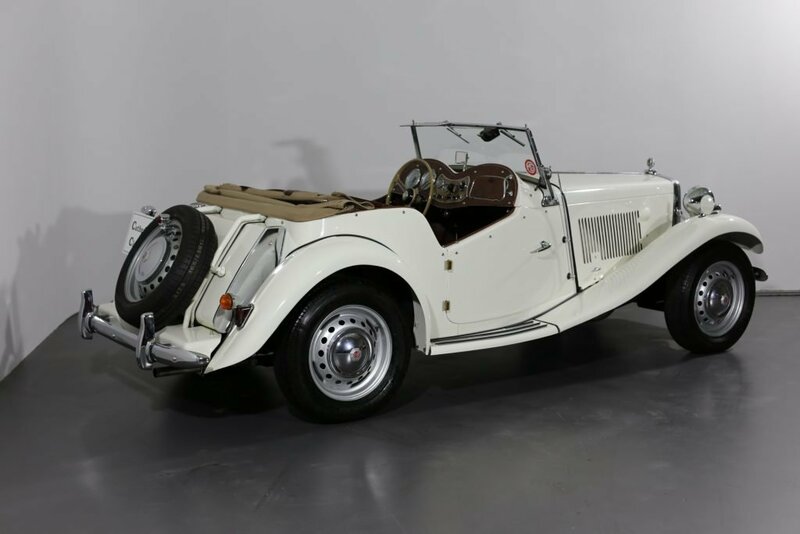 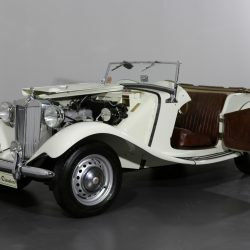 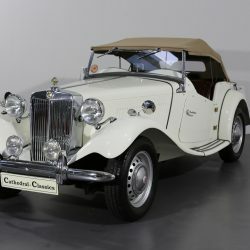 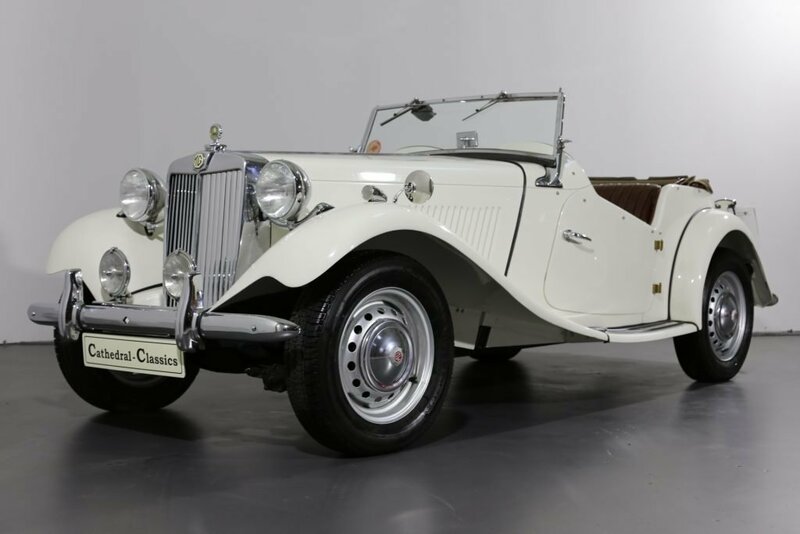 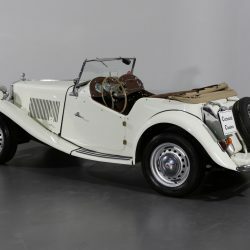 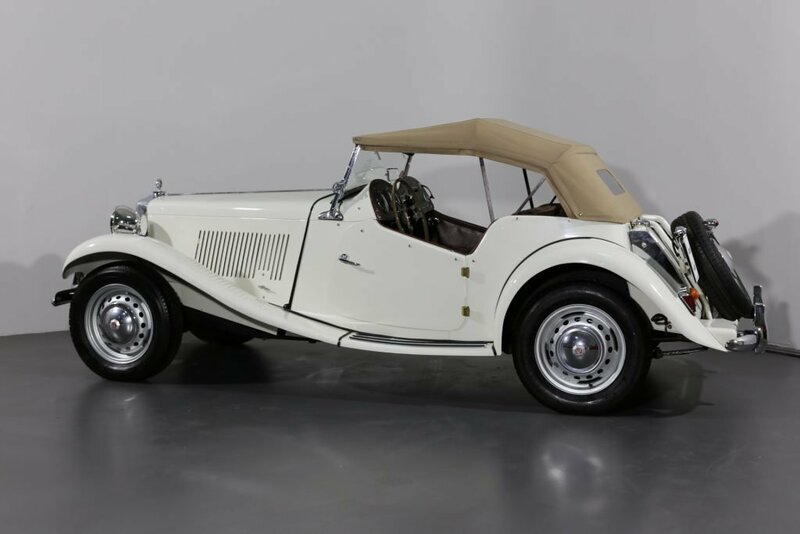 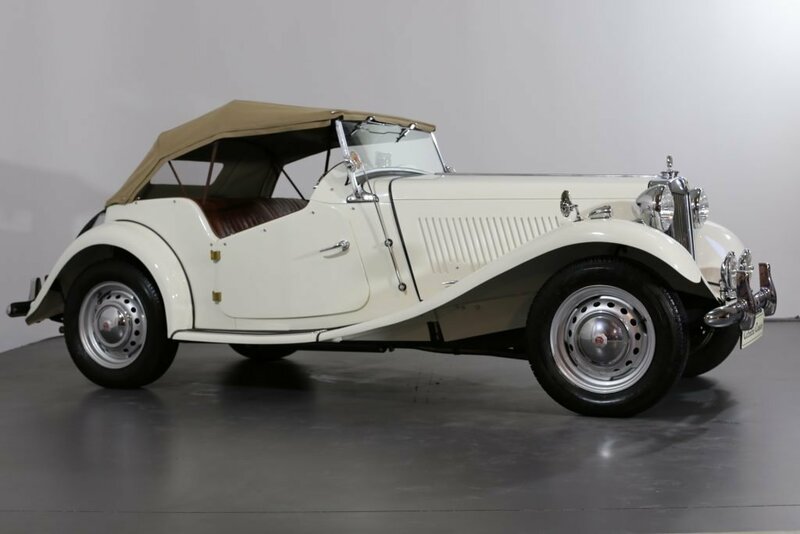 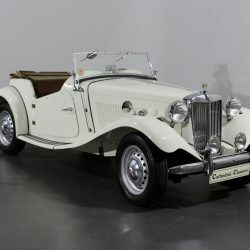 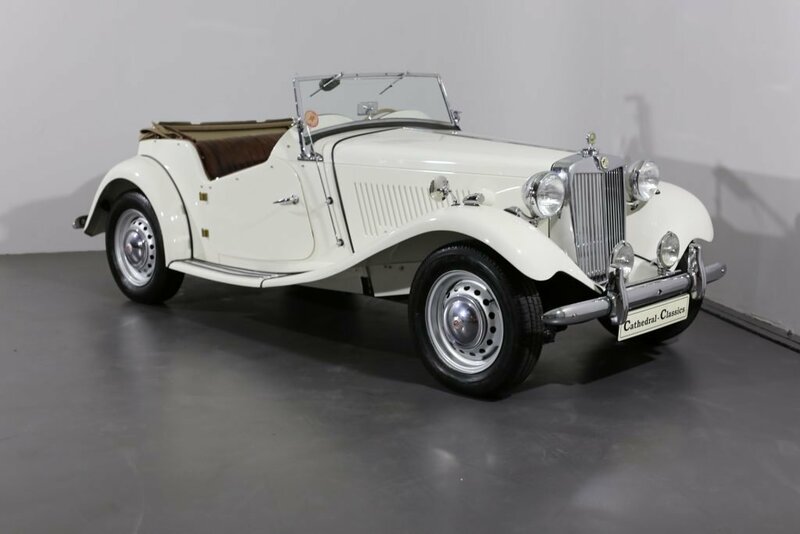 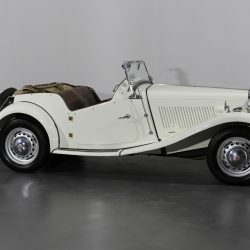 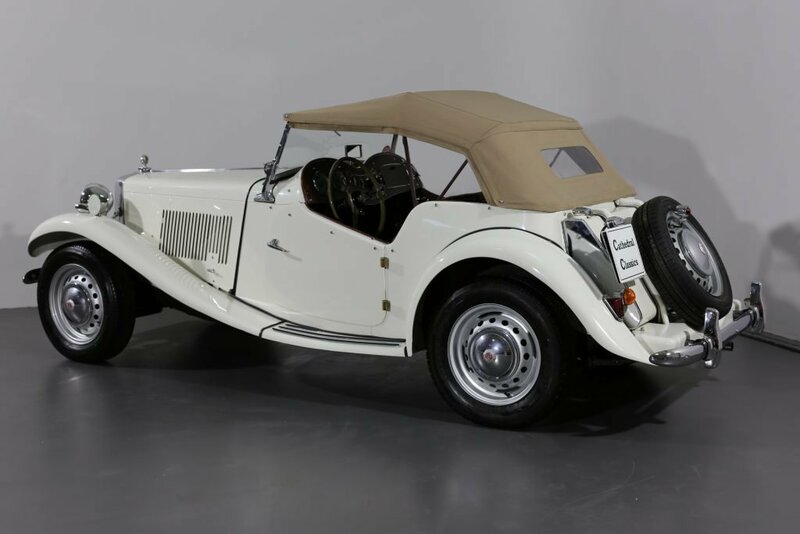 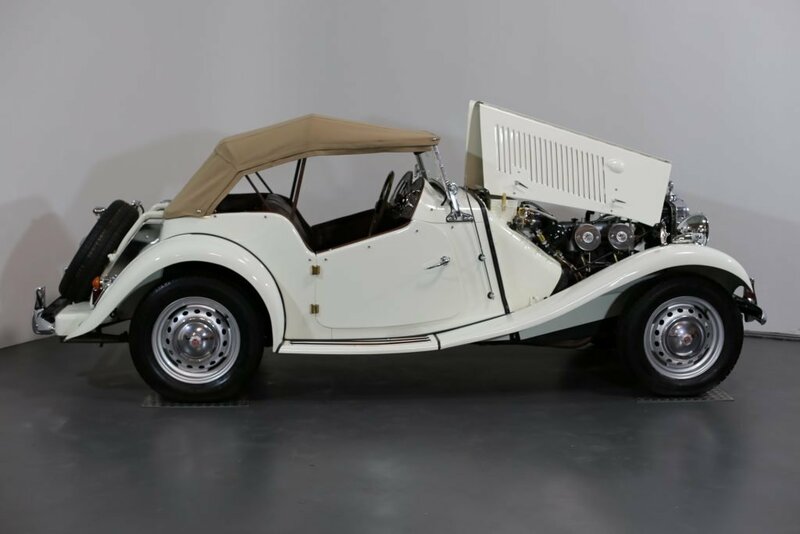 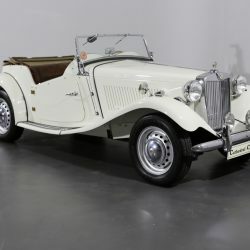 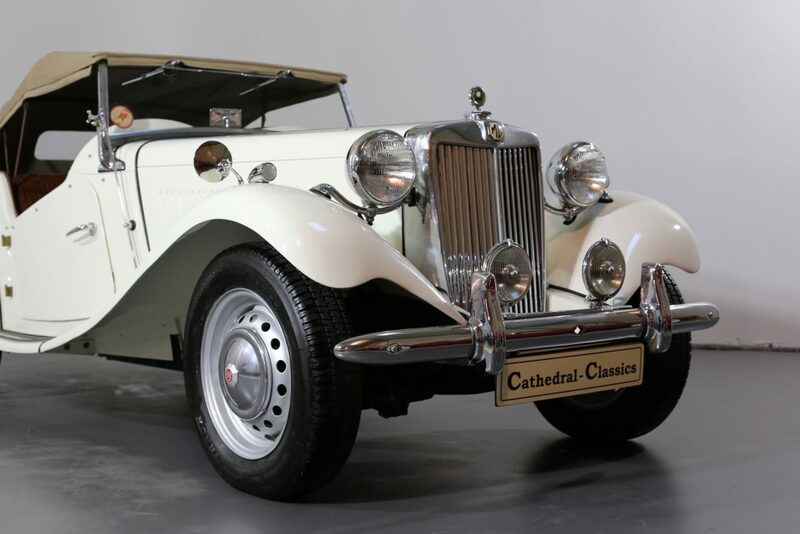 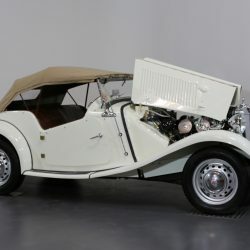 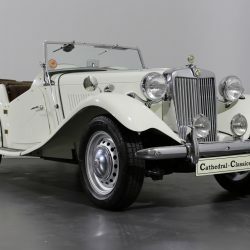 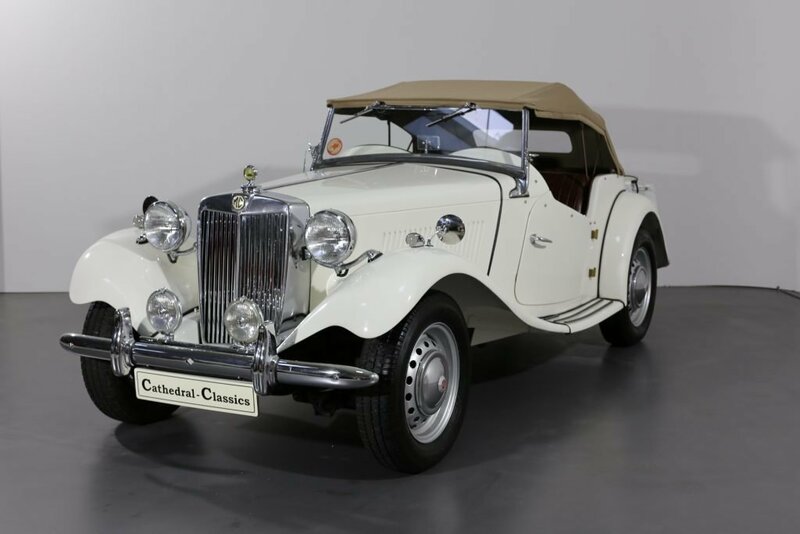 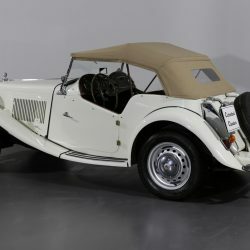 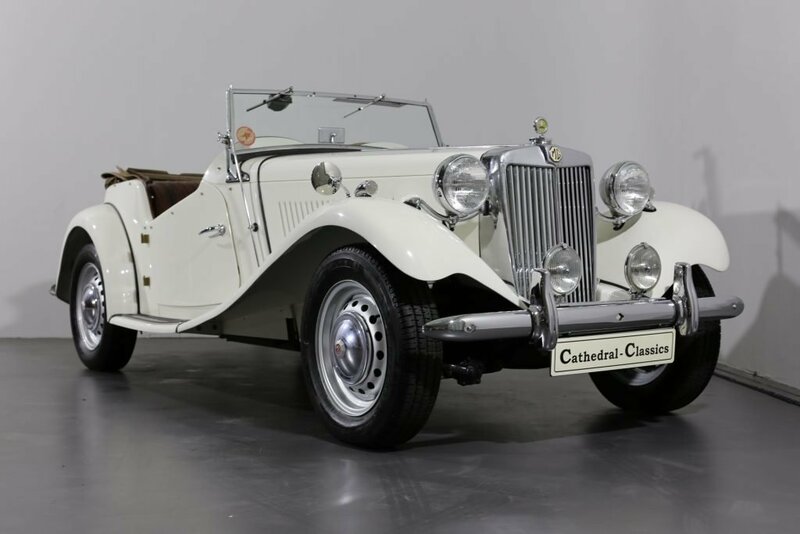 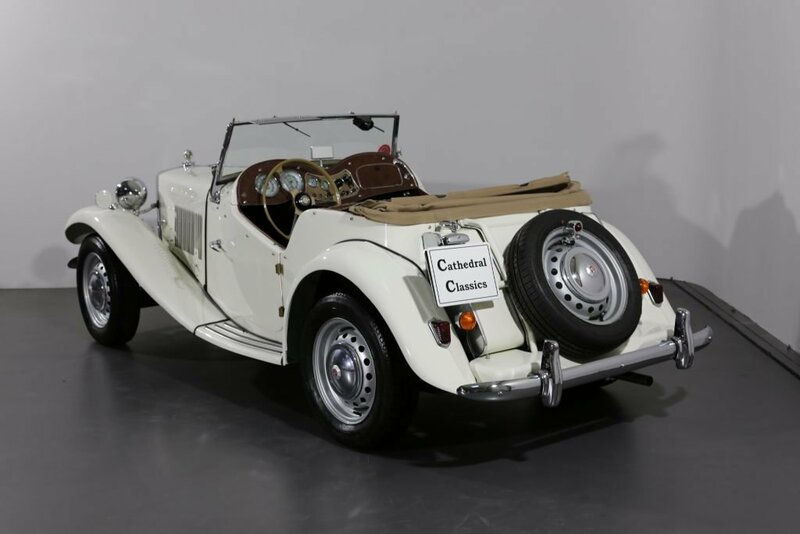 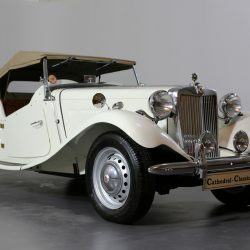 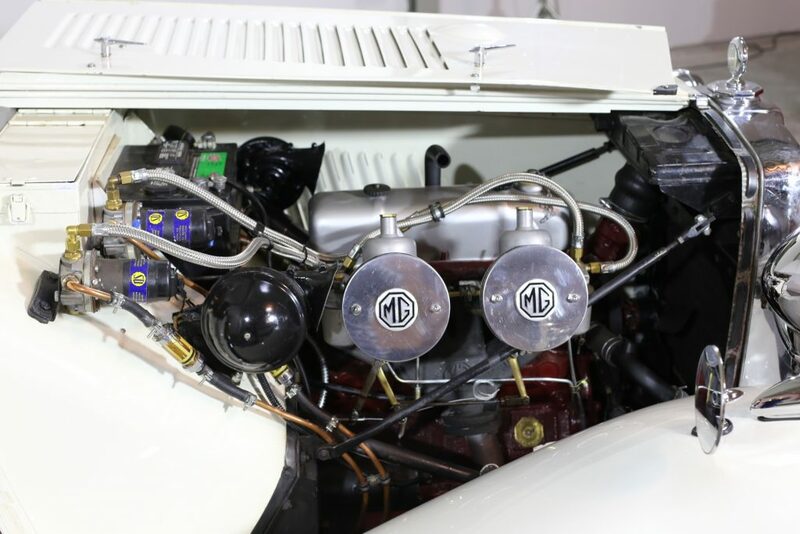 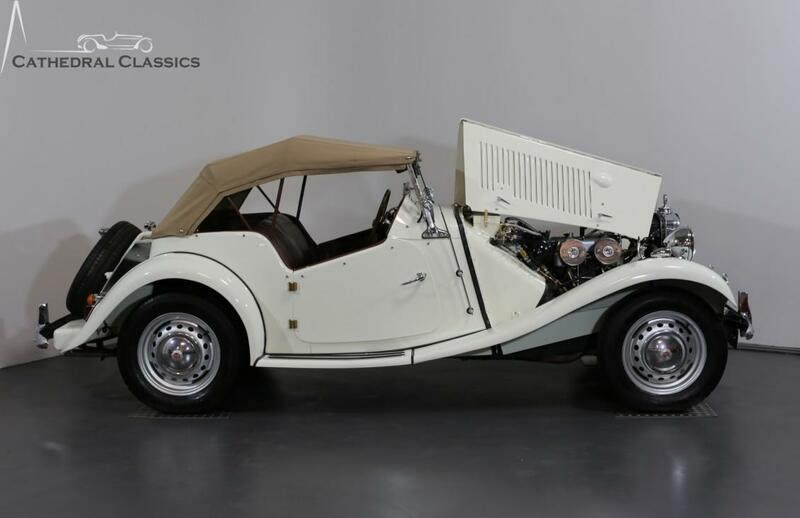 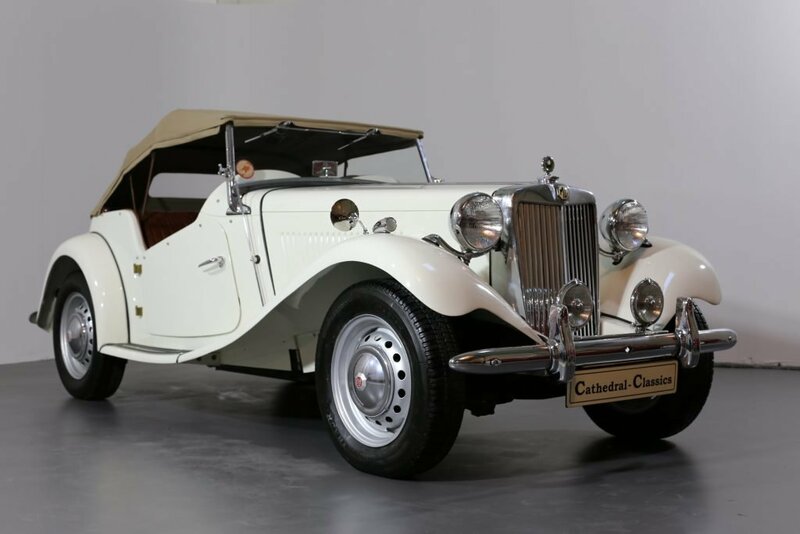 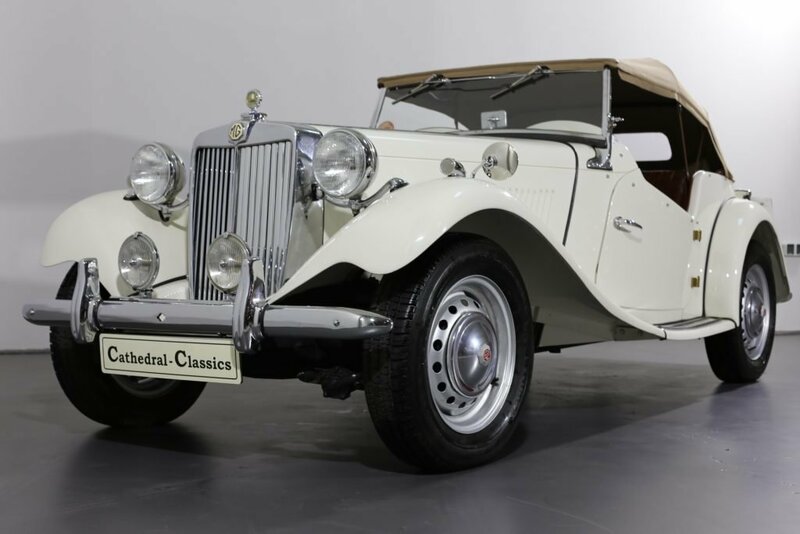 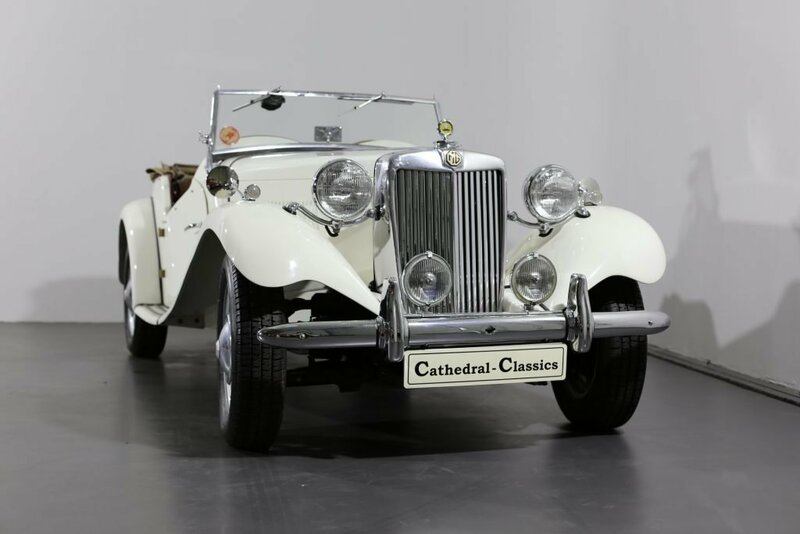 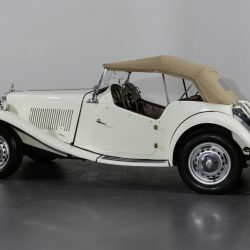 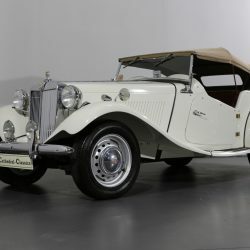 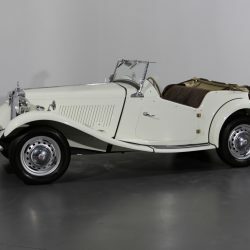 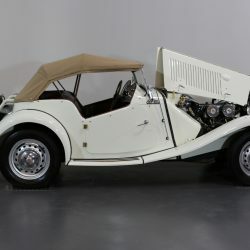 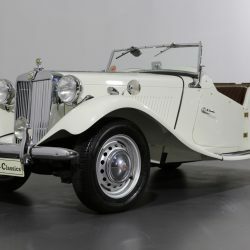 HISTORY FILE – Our charming MG TD / C for (competition) chassis number: TDC 12713 was imported to the UK from the United States of America direct from renowned classic car dealer Gullwing Motor Cars in 2016, by a long standing MG Car Club member of over 50 years. 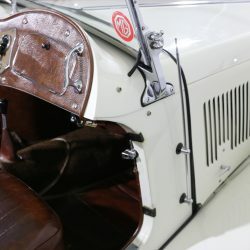 Clearly a fastidious man, his attention to detail and indeed innovative ideas have set this remarkable little car in good stead. 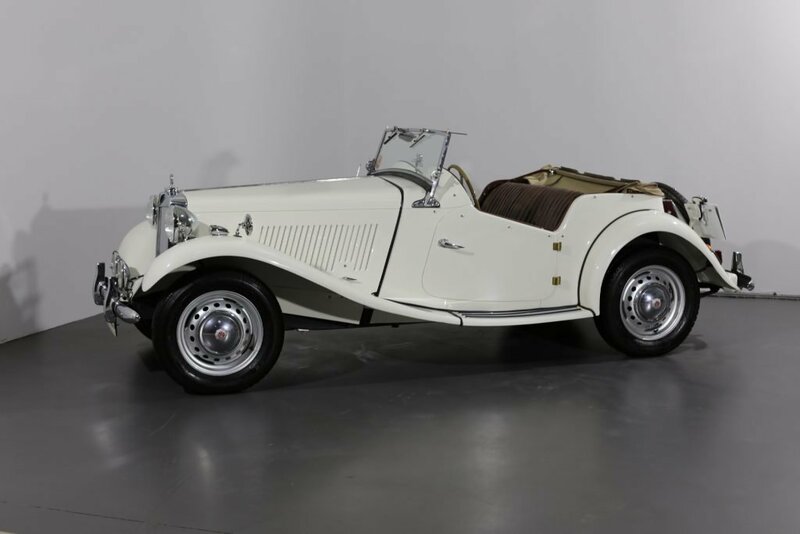 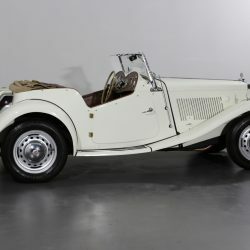 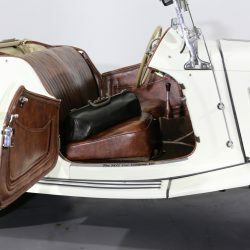 Over a two year period his improvement investment of some £15120 alone, have enhanced the car to a wonderful standard and will thrill any MG fan who cares to purchase this delightful example. 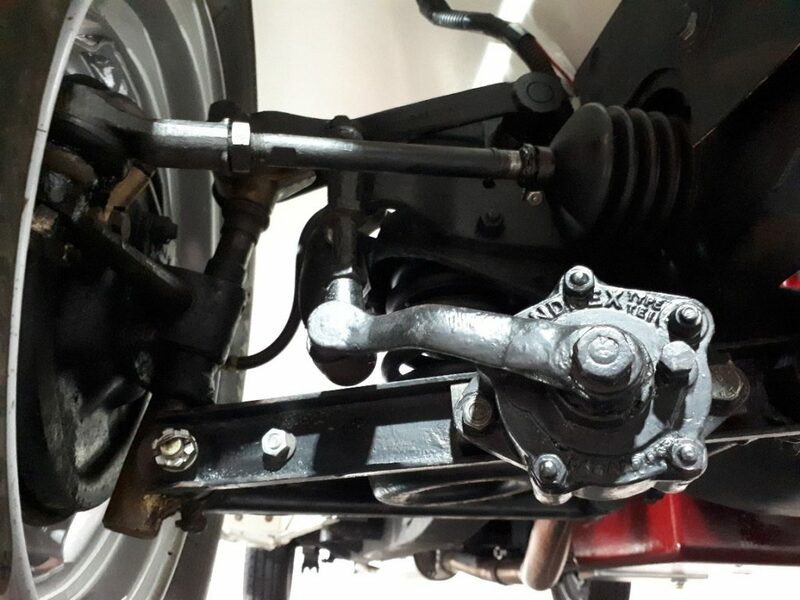 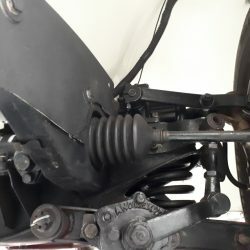 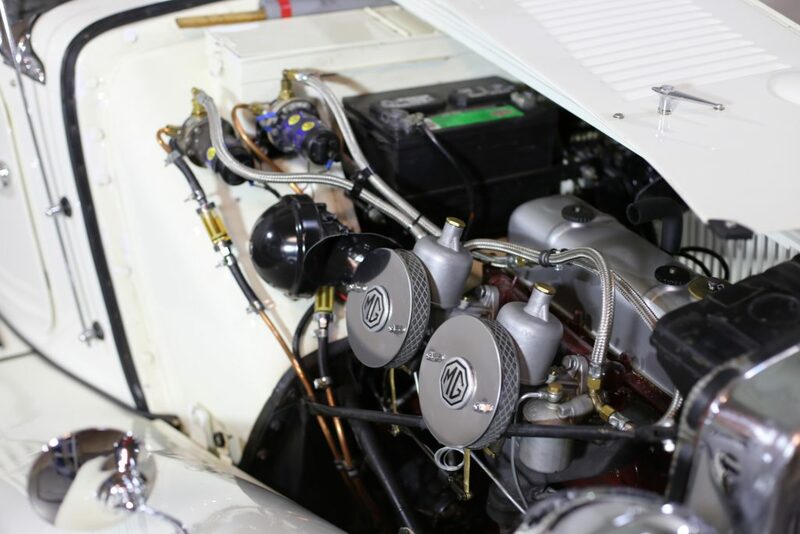 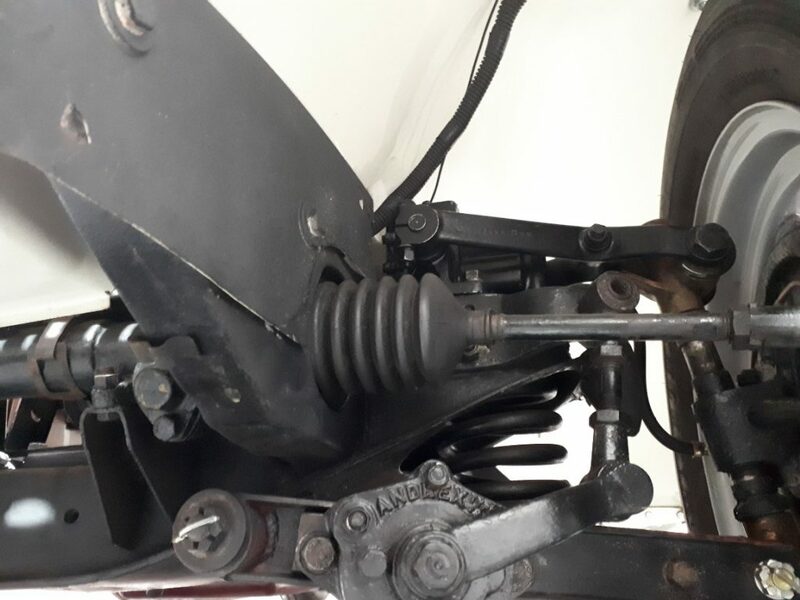 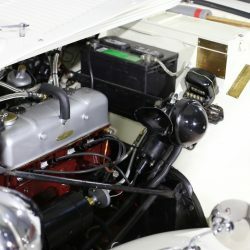 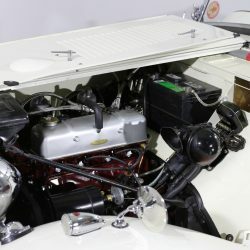 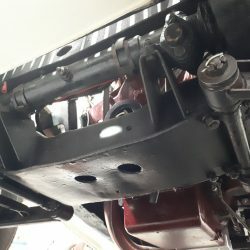 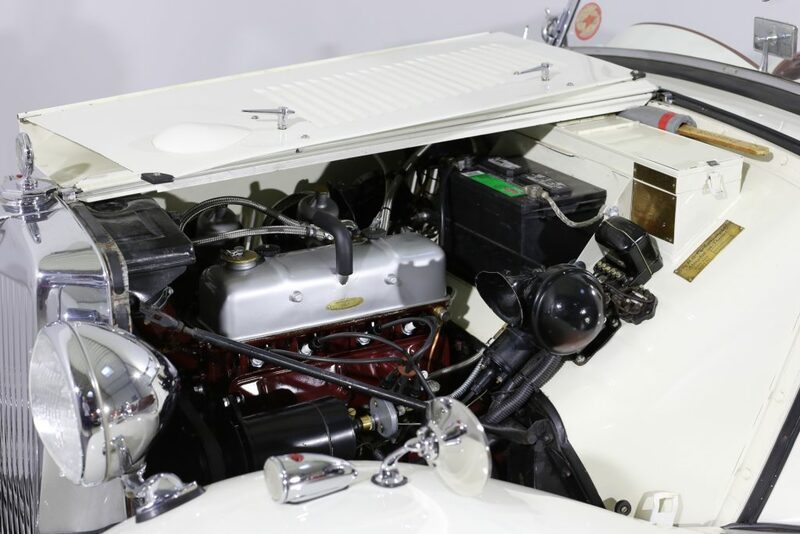 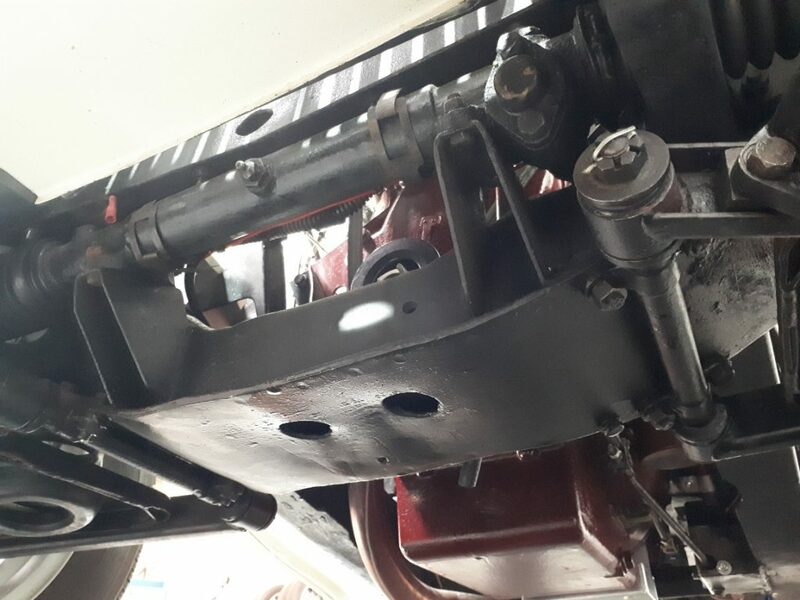 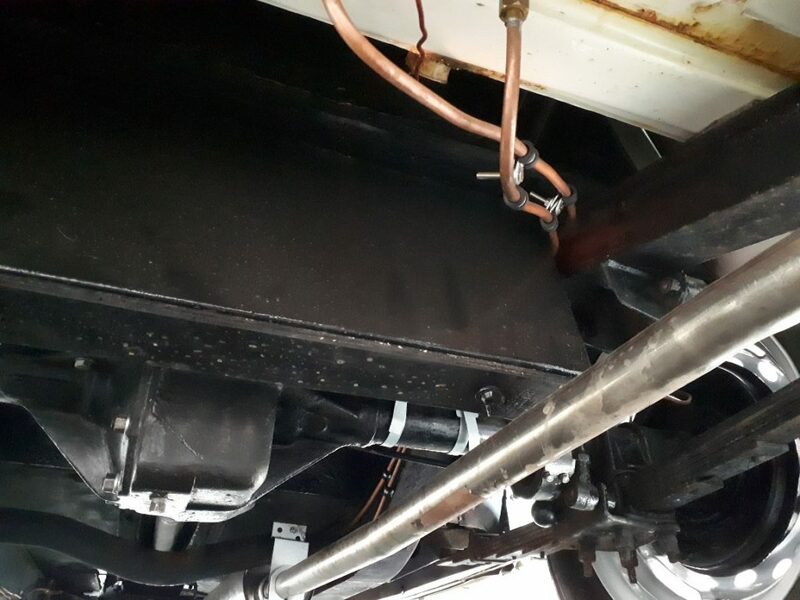 The restoration period culminates with a complete engine, gearbox and rear axle rebuild; the extent of work is too much to list, but the engine rebuild alone is an investment of over £9000. 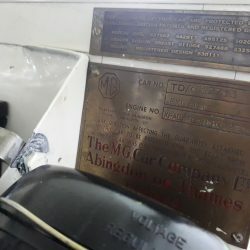 The cars box history file is now ready for the next MG custodian. 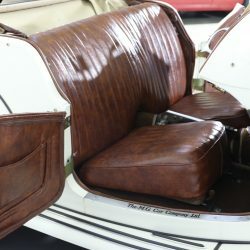 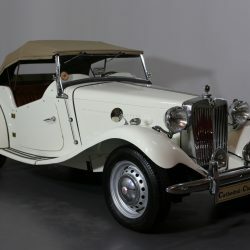 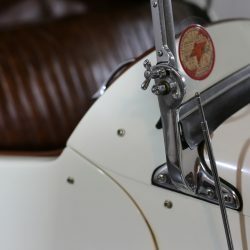 EXTERIOR – Finished in Ivory with plenty of chrome and bling to keep clean over those long dark winter nights, one must remember this little “open two-seater” is over 60 years old. 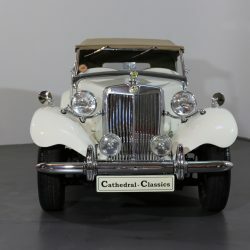 It’s not perfect by any stretch of the imagination but, apart from an obvious small grill repair at some stage and a tiny stress imperfection on the bonnet, the car is utterly charming. 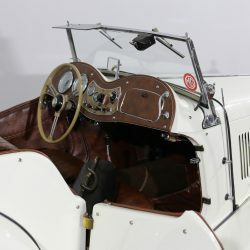 The beige all weather equipment is tight and in superb condition. 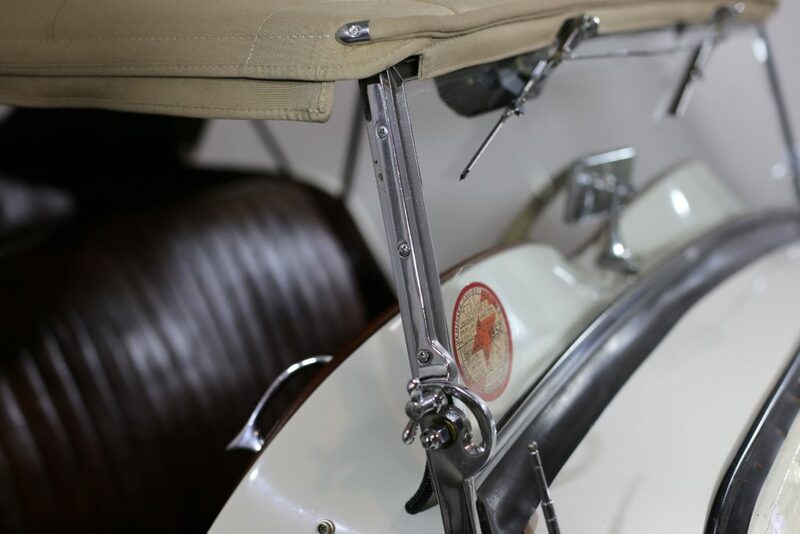 Frames for the sides are available without material for the next owner. 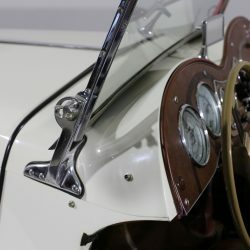 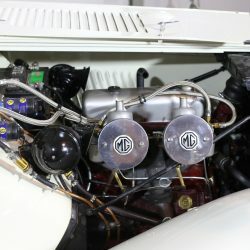 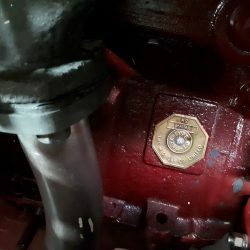 The chrome MG emblem bonnet locks are sadly a sign quality that will never be repeated. 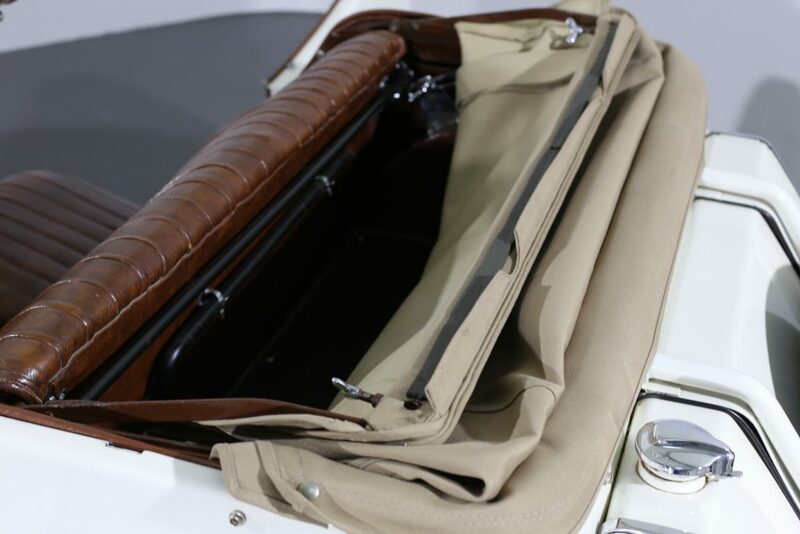 INTERIOR – Surprisingly, there is quite a bit of room behind the tight reclining seats for soft luggage. 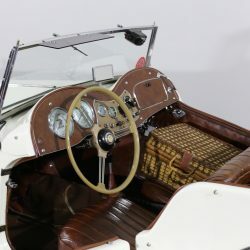 Brown leather throughout the cabin, including doors, dash facia and luggage area are all in superb condition and are just oozing charm. 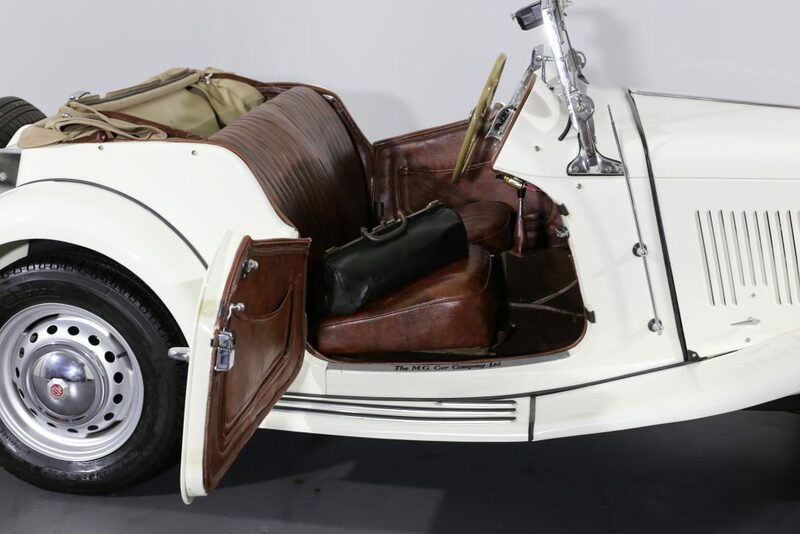 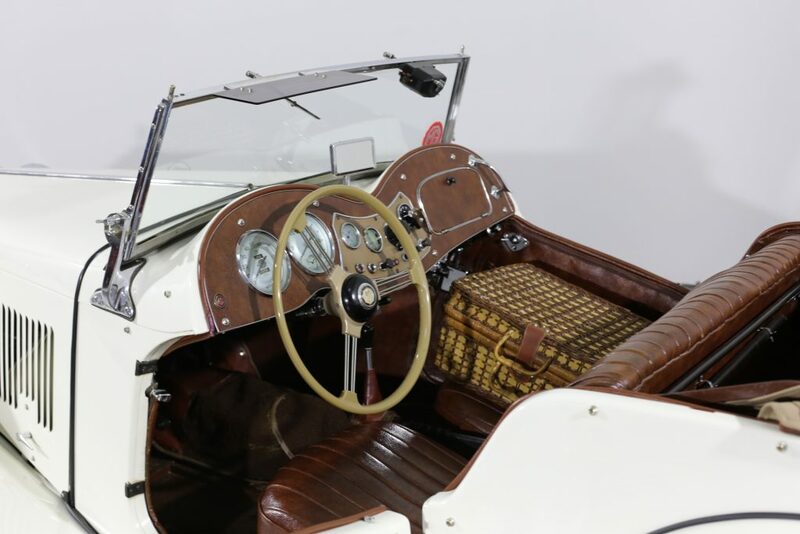 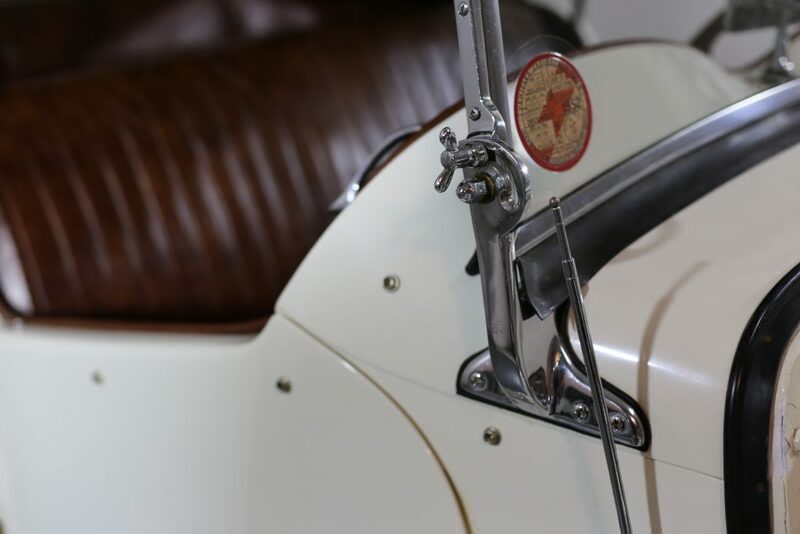 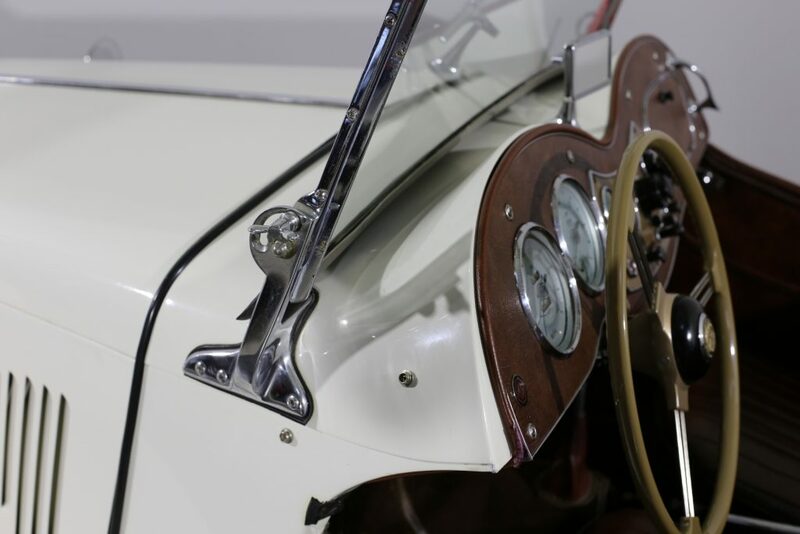 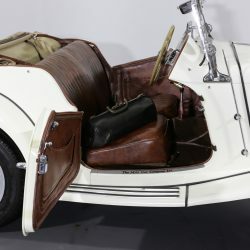 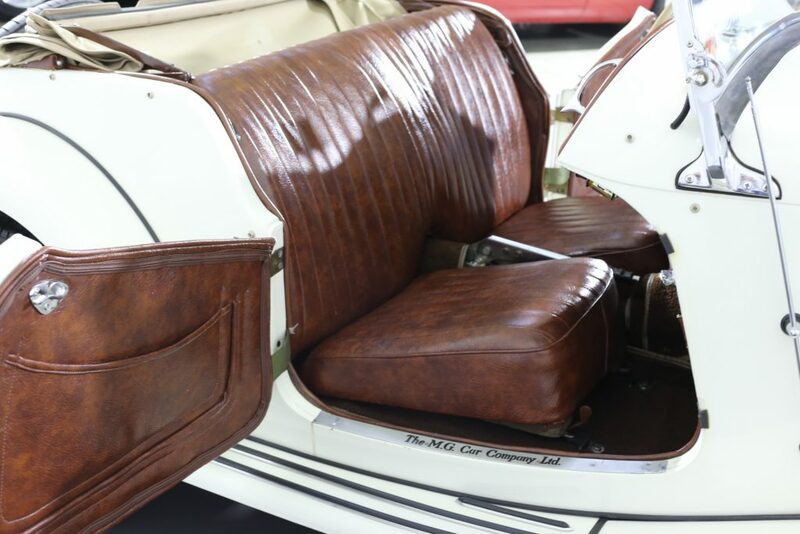 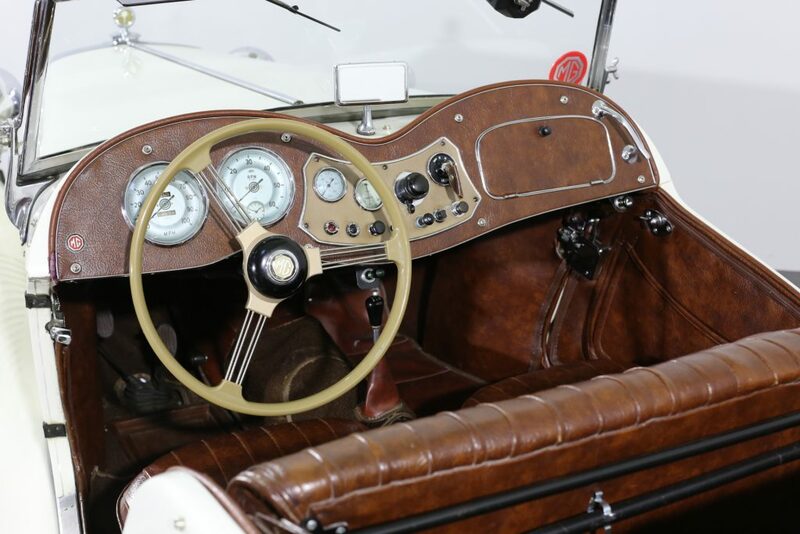 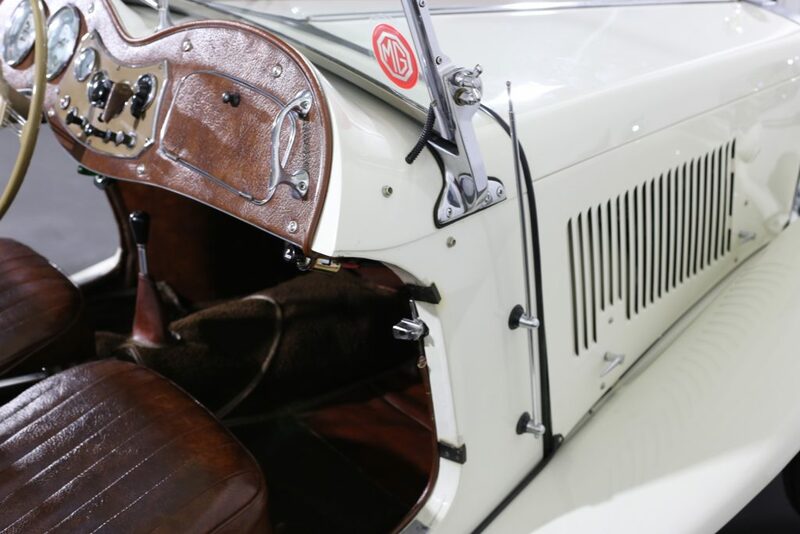 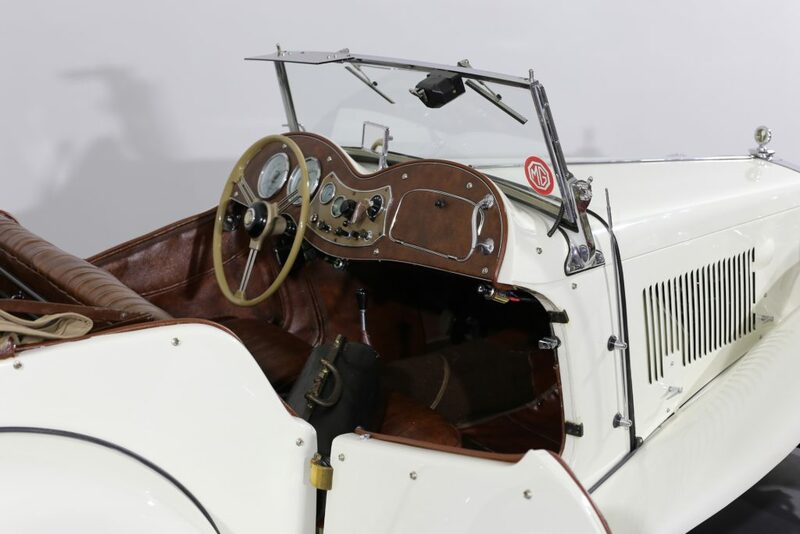 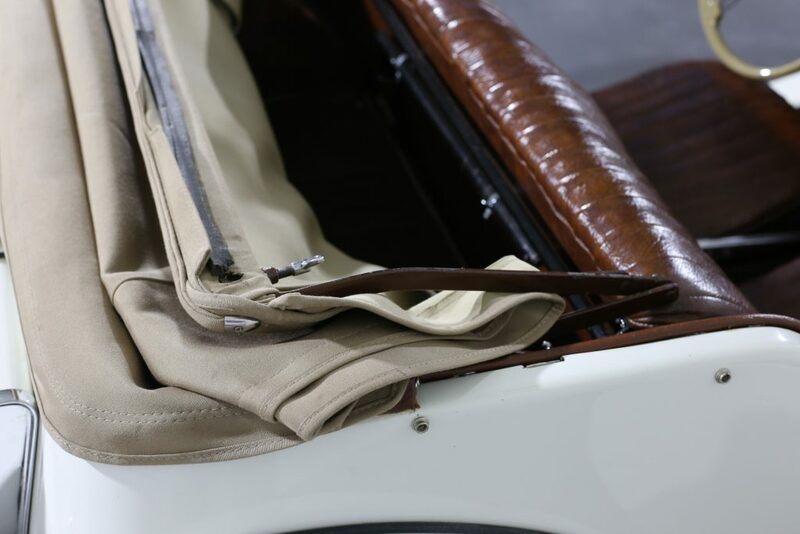 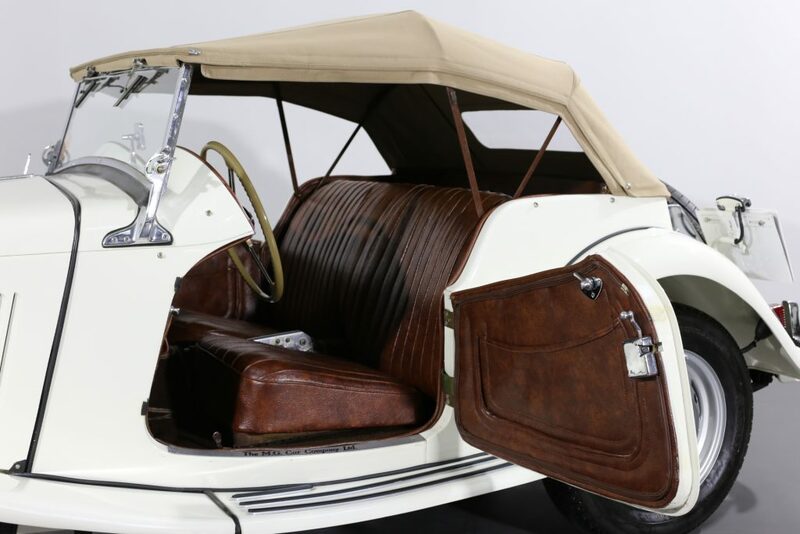 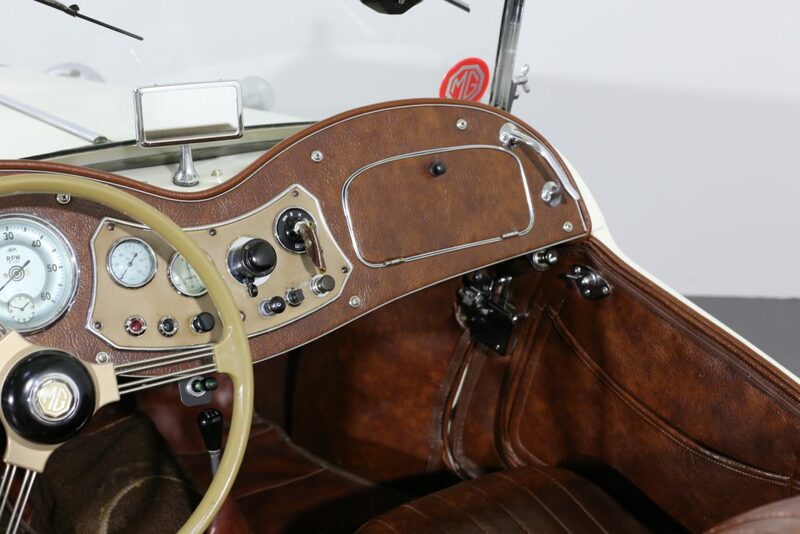 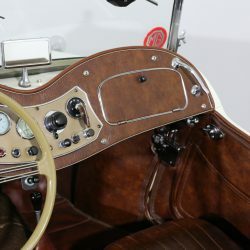 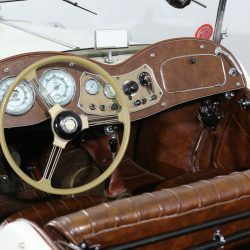 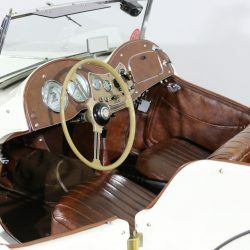 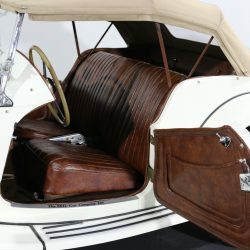 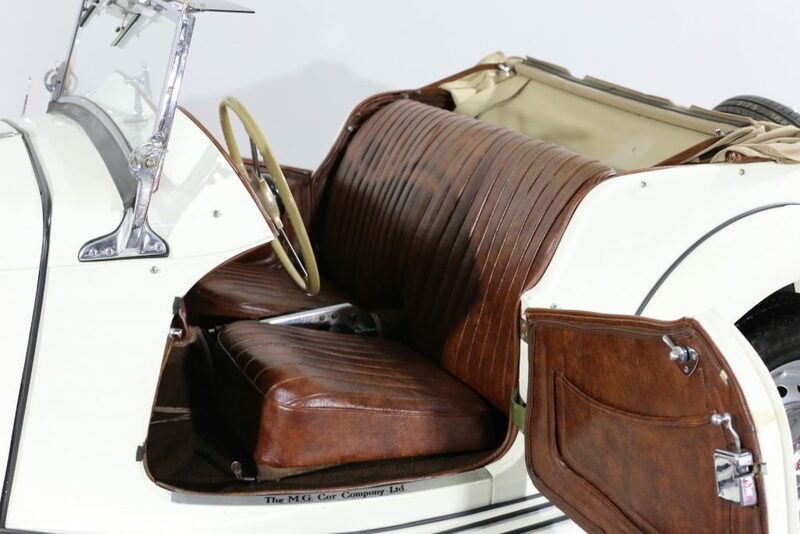 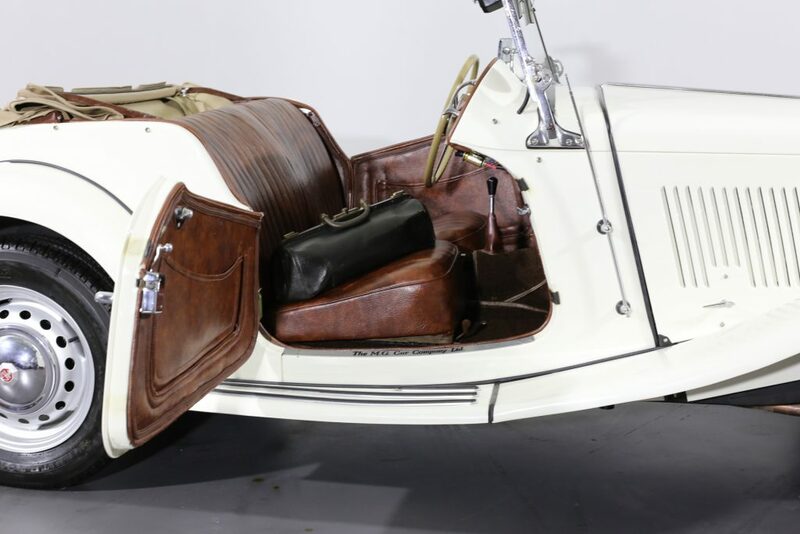 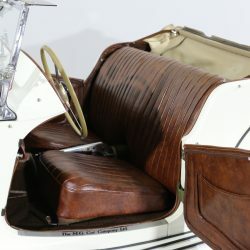 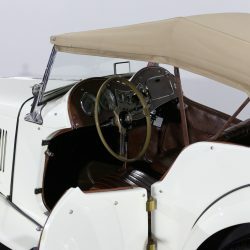 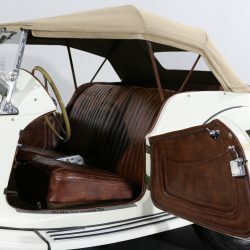 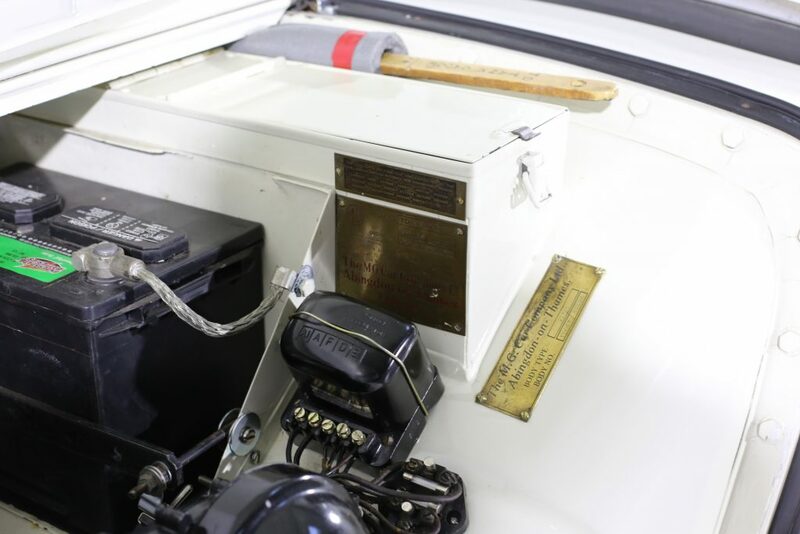 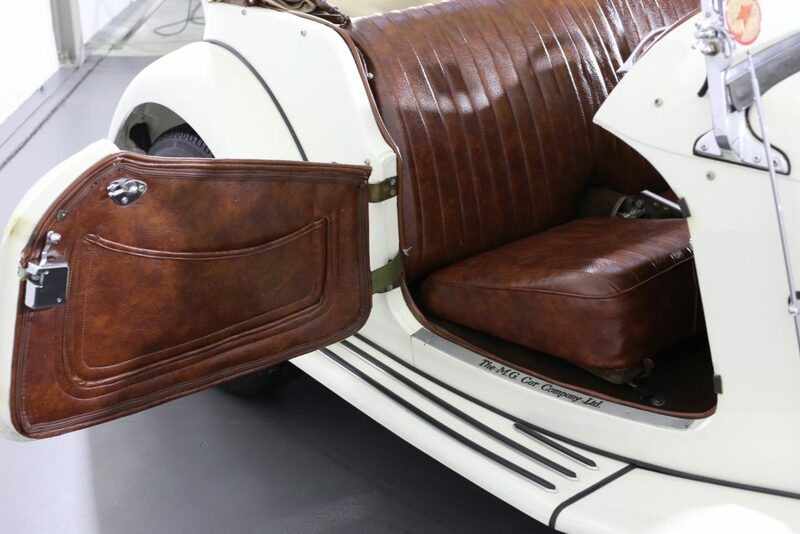 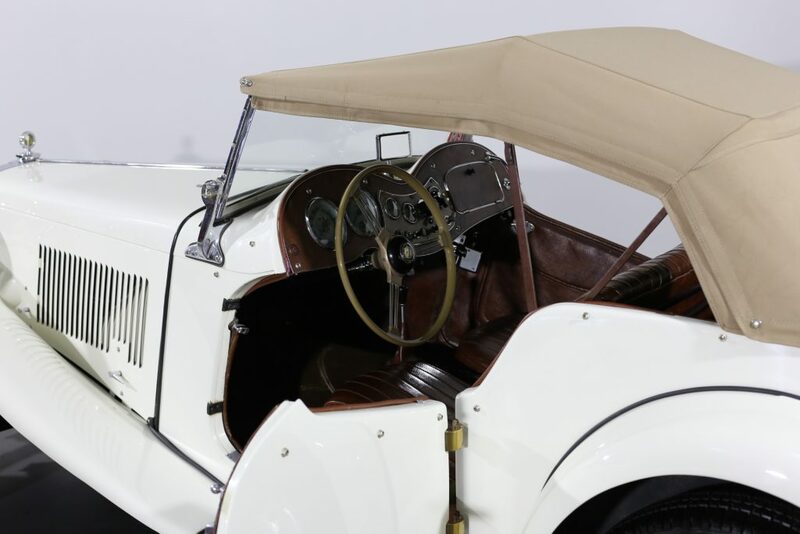 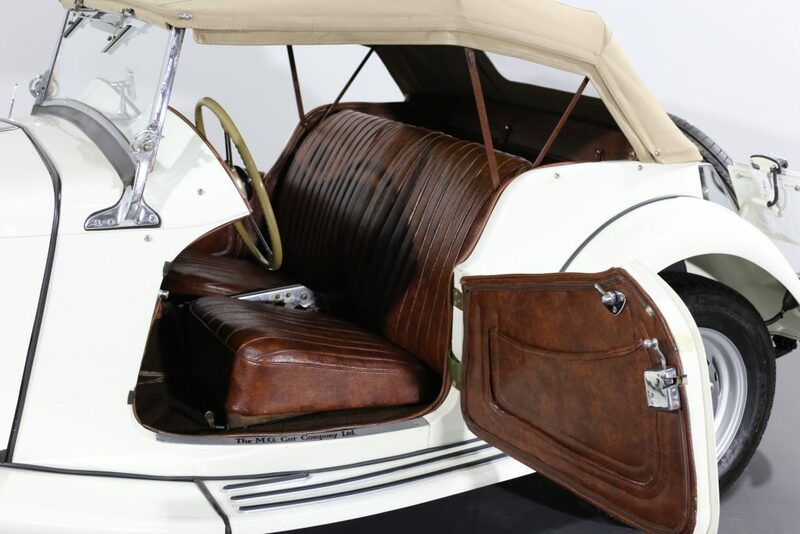 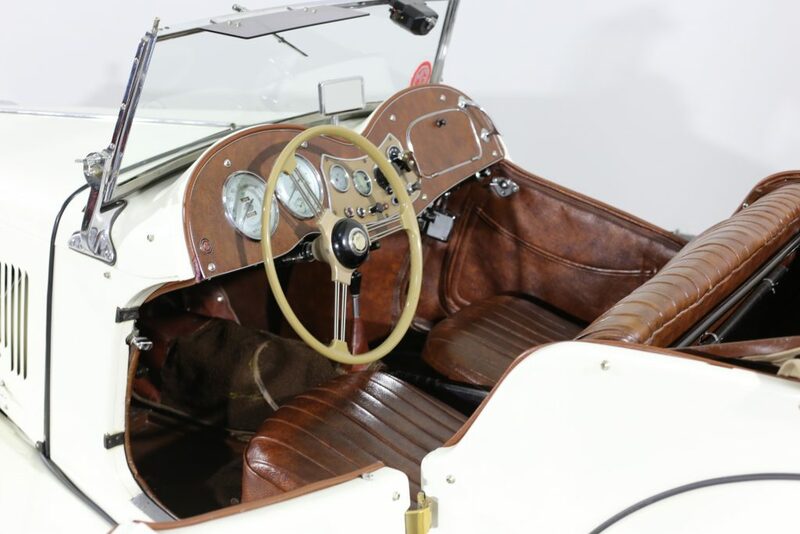 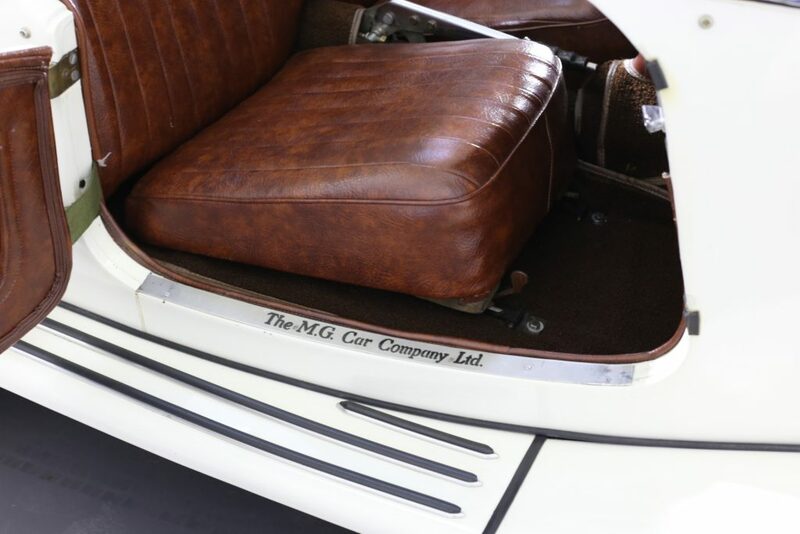 Brass door hinges and a new steering wheel are just two items of trim that catch the eye of any MG aficionado. 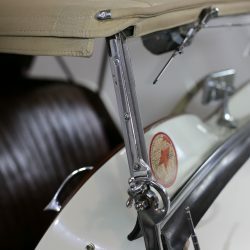 The chrome passenger dash grab handle replaces any ideas of seat belts! 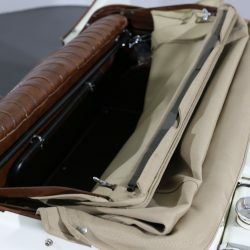 We are also offering with the car with two wind deflectors to be fitted when the windscreen is lowered, along with many other spare items pertaining to the vehicle. 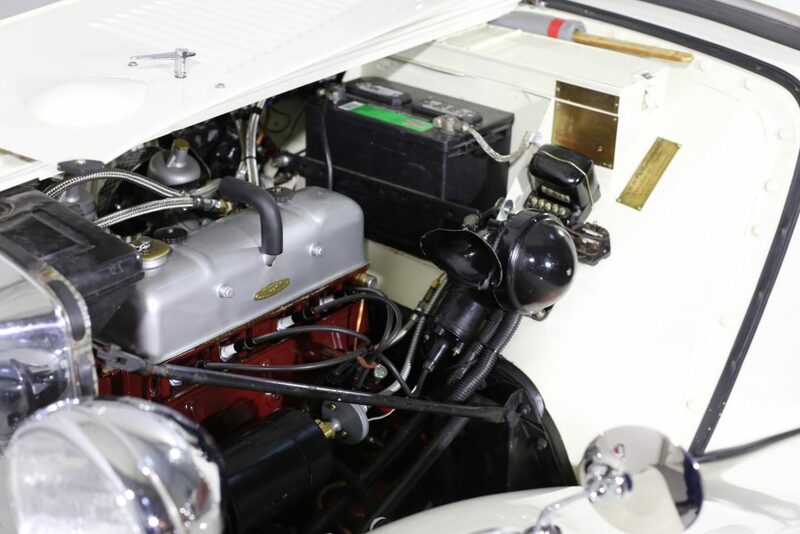 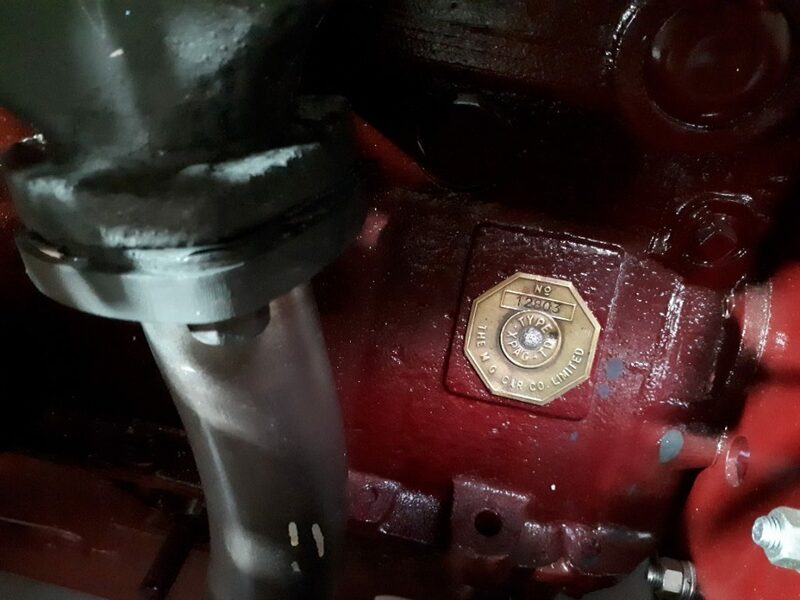 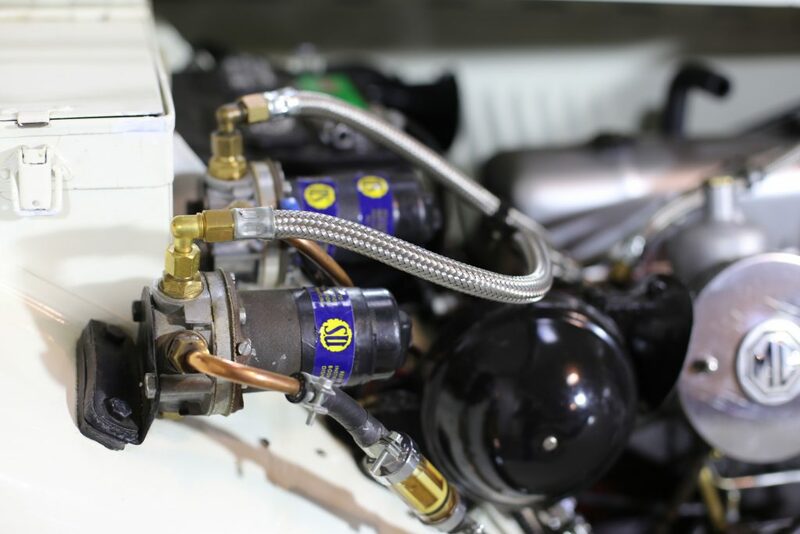 ENGINE & TRANSMISSION – The matching engine number 12803 OHV 1250cc unit, has been subjected to a comprehensive rebuild by marque specialist Maidstone Sports Cars in Kent. 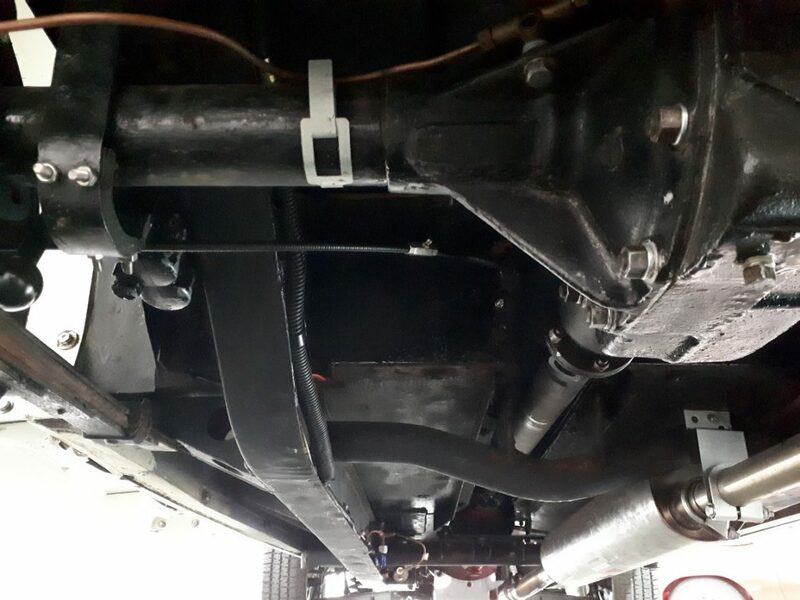 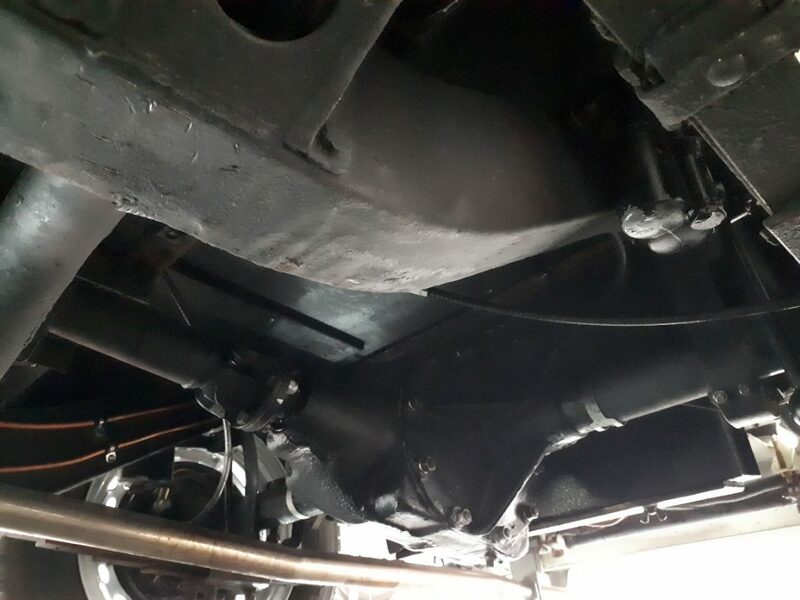 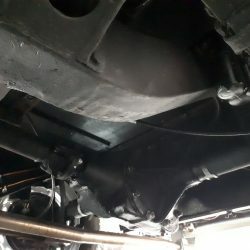 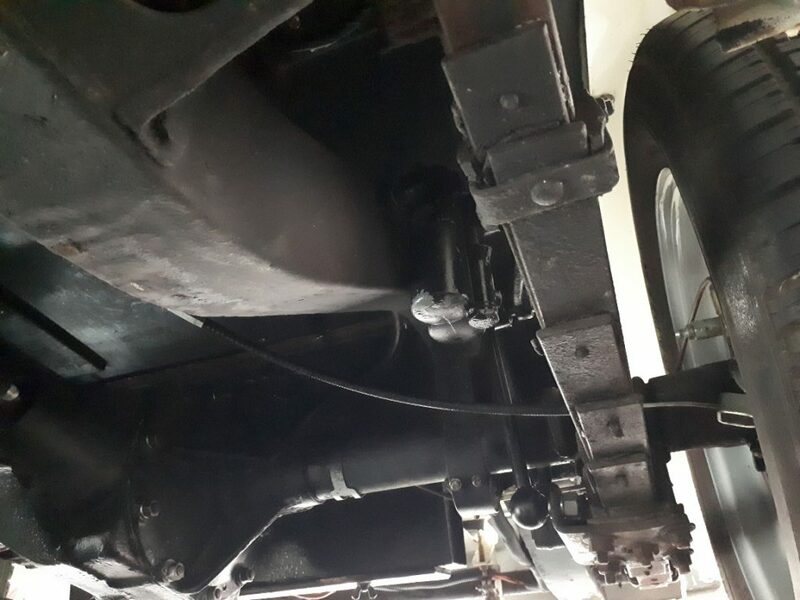 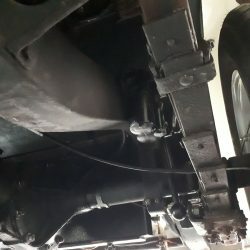 Five pages list the detailed work done which also includes a full gearbox and axle rebuild. 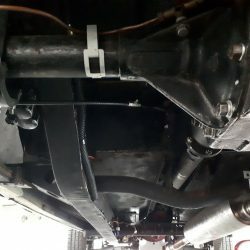 The extent of the work is simply far too much to list but, needless to say, at just shy of a total of £11,000 the work carried out is extensive. 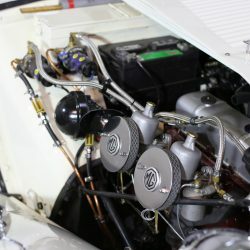 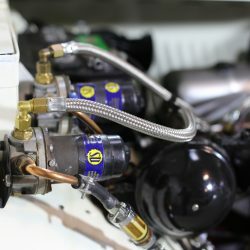 A full cylinder head unleaded conversion; crankshaft and bearings are a flavour of the work carried out, along with new fuel lines to the twin (unique to the C model) fuel pumps. 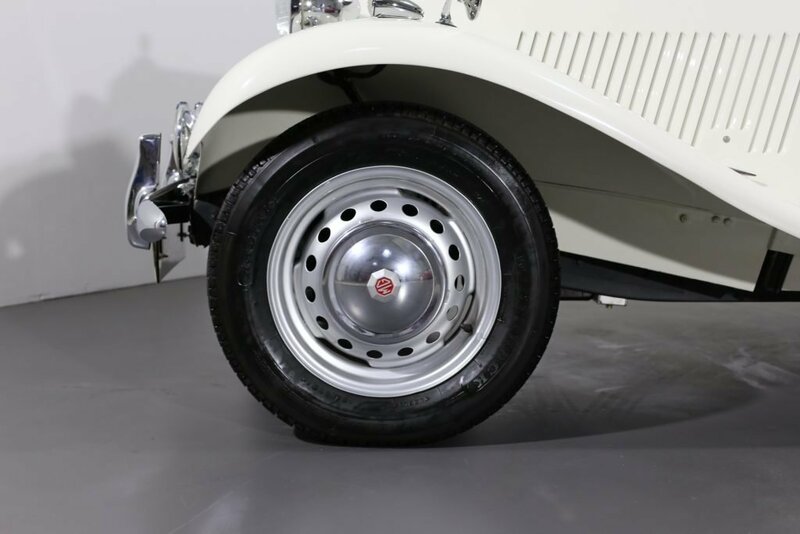 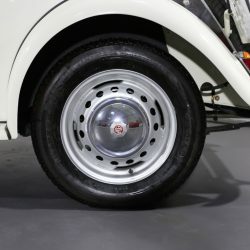 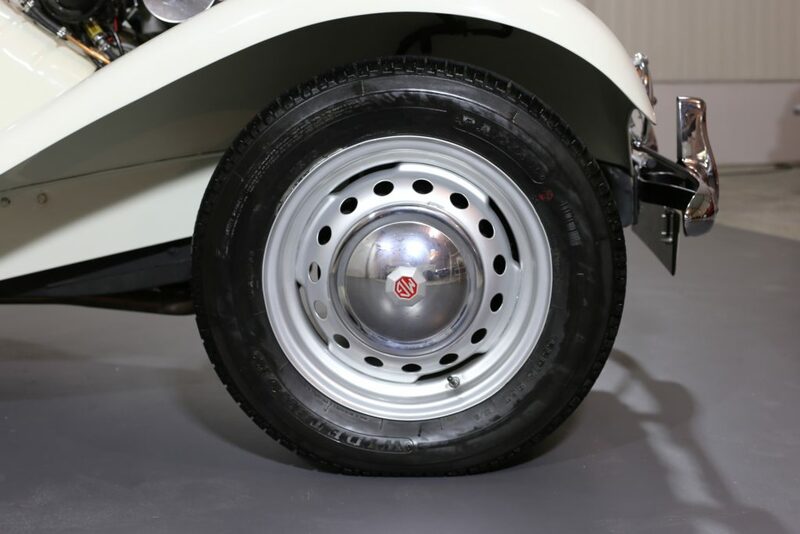 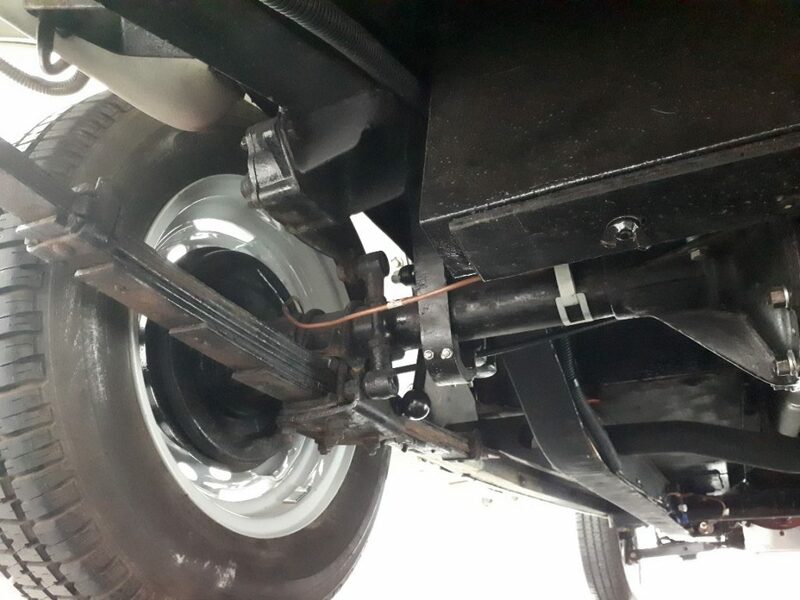 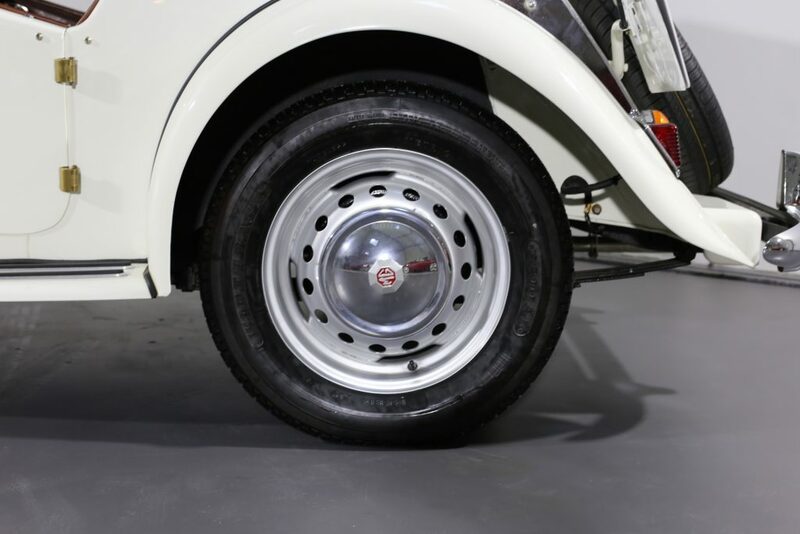 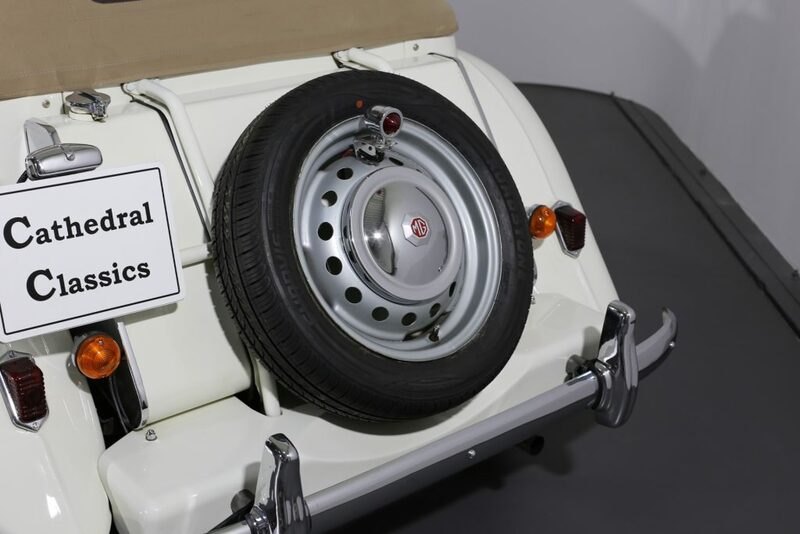 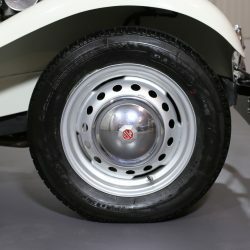 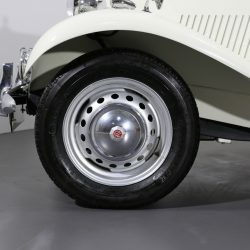 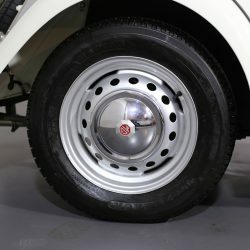 WHEELS, TYRES & BRAKES – The original disc type steel wheels are clad in Radial 165 R15 tyres and offer plenty of life with of course chrome hubcaps with red MG emblem. 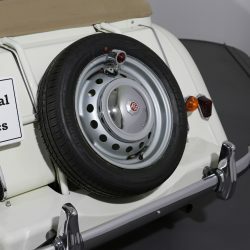 The spare tyre on the externally attached spare wheel is new. 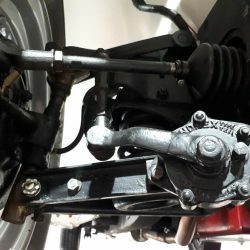 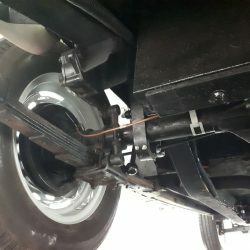 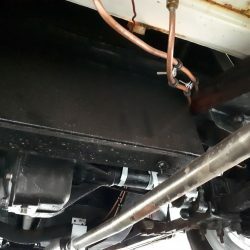 The Lockheed hydraulic brakes take a little getting used to but, pull the car up adequately well. 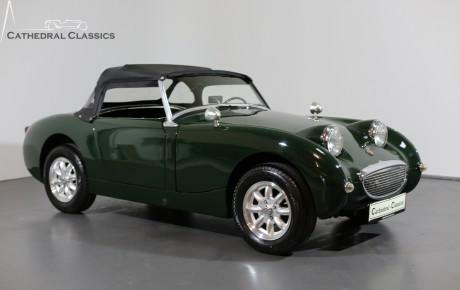 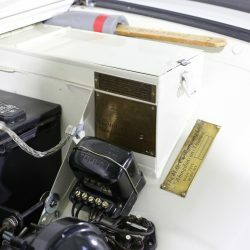 Significant early Austin Healey ‘frogeye’ Sprite (nr 169) with matching numbers. 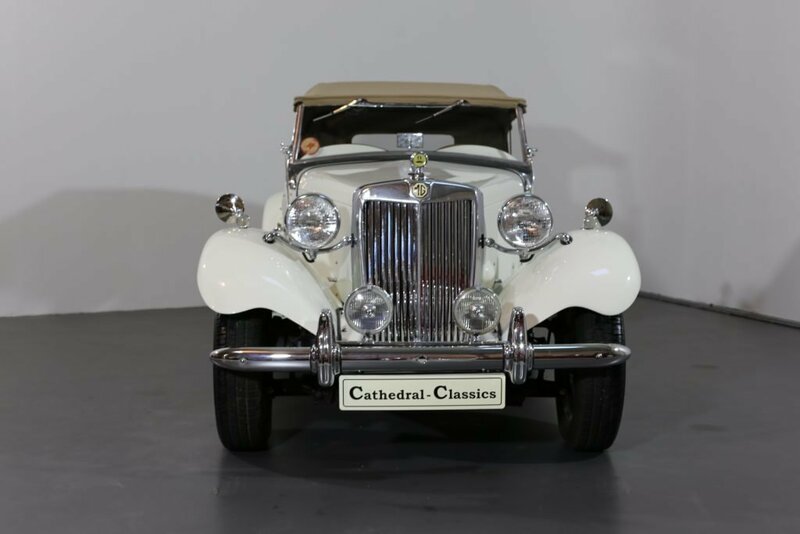 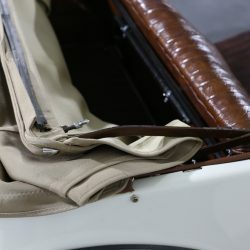 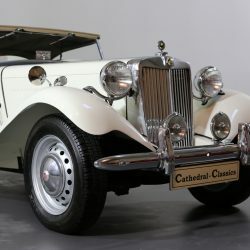 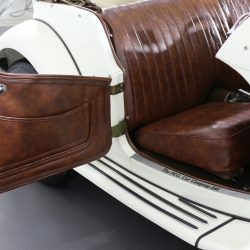 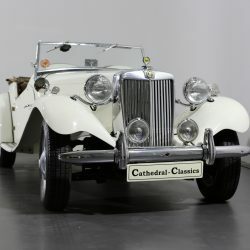 Cathedral Classics was formed to finally keep the frustrations at bay of a tortured Classic Car fan and enthusiast of some 40 years. 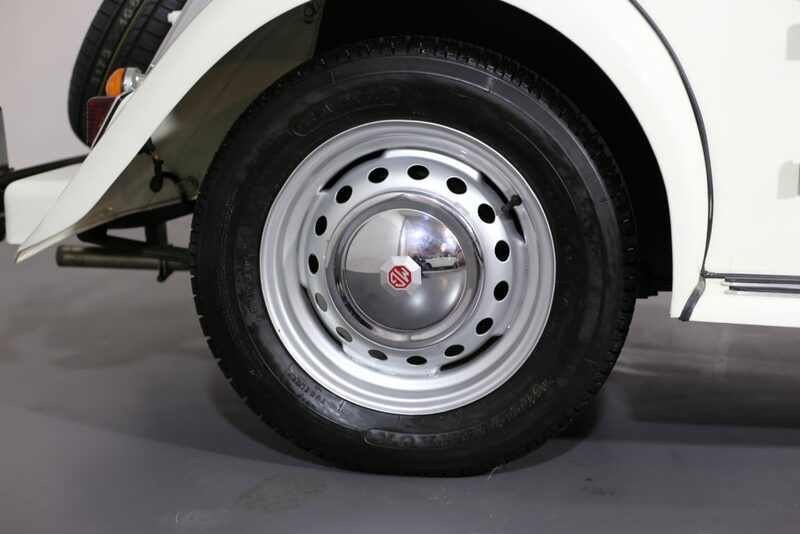 Following a successful career in Germany selling tax free cars to Service Personnel, in particular, managing Audi UK’s Audi Military Sales programme, Stewart J. Roy felt the time was right to ‘make the move’ and fulfil a dream.